Winter and Spring 2016 photo galleries are combined due to the winter season being a washout. Heavy rains around Christmas trashed the water shutting down our usual pristine winter sight-fishing for the first time in 13 years. We cancelled trips left and right until the water finally cleared in March. 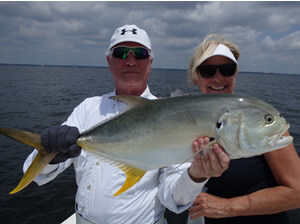 Once spring arrived the fishing turned on as expected and we focused on redfish, pompano, jack crevalle and amberjacks. 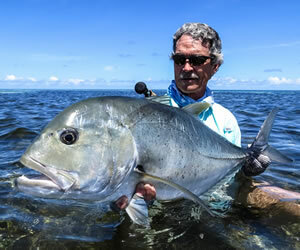 Highlights from this gallery are our all-time boat records for fly-caught redfish and amberjacks, plus Bob Jenkins achieving the Emerald Coast Grand Slam on fly. The Slam has only happened twice in 13 years. We hope you enjoy the photos from Winter and Spring, 2016. Click on the thumbnails for full-screen photos. 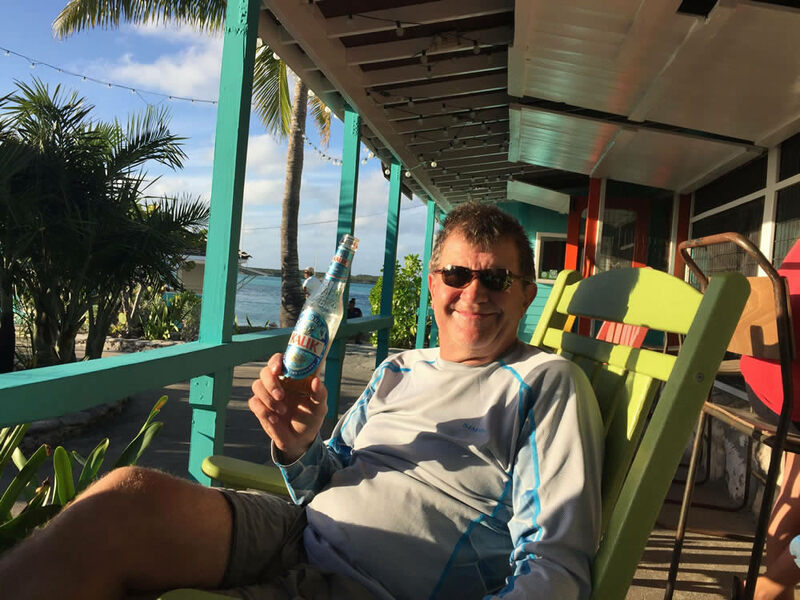 For photos from previous seasons click on the links to these additional galleries: Fall 2015, Summer 2015, Spring 2015, Winter 2015, Fall 2014, Summer 2014, Spring 2014, Winter 2014, :Fall 2013, Summer 2013, Spring 2013, Winter 2013, Fall 2012, Spring 2012, Winter 2012, Fall 2011, Summer 2011, Spring 2011, Winter 2011, Fall 2010, Summer 2010, Spring 2010, Winter 2010, Fall 2009,Summer 2009, Spring 2009, Winter 2009, Fall 2008, Summer 2008, Spring 2008, Winter 2008, Fall 2007, Summer 2007, Spring 2007, Winter 2007, Fall 2006, Summer 2006, Spring 2006, Winter 2006, Spring 2005, Summer 2005, Fall 2005. Use the back button on your browser to return to this page. 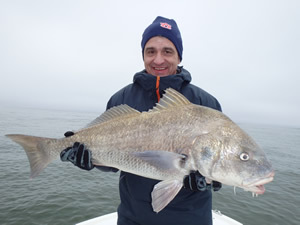 Jim Himmelwright starts us off the year with an impressive black drum on a cool January 8. 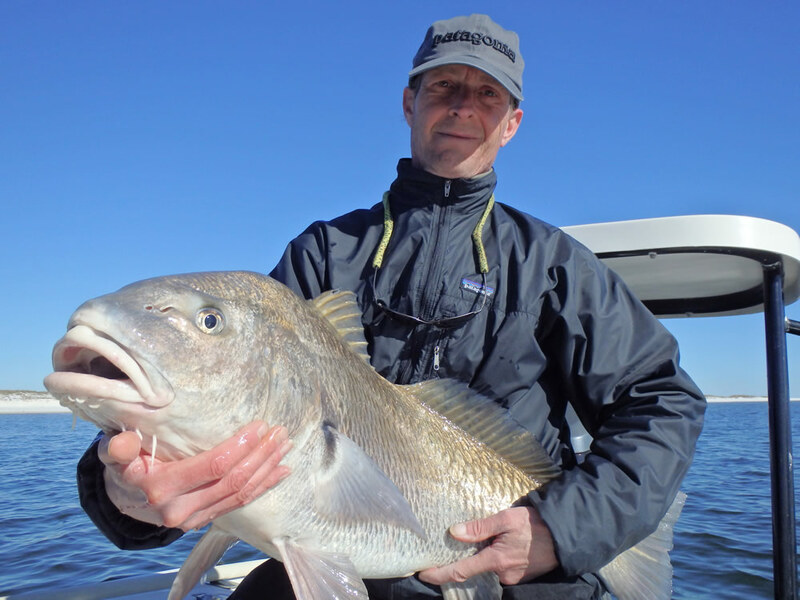 The water was off-color from all the rain, so we resorted to blind-casting Spro bucktail jigs in areas where redfish and black drum congregate during the winter months. 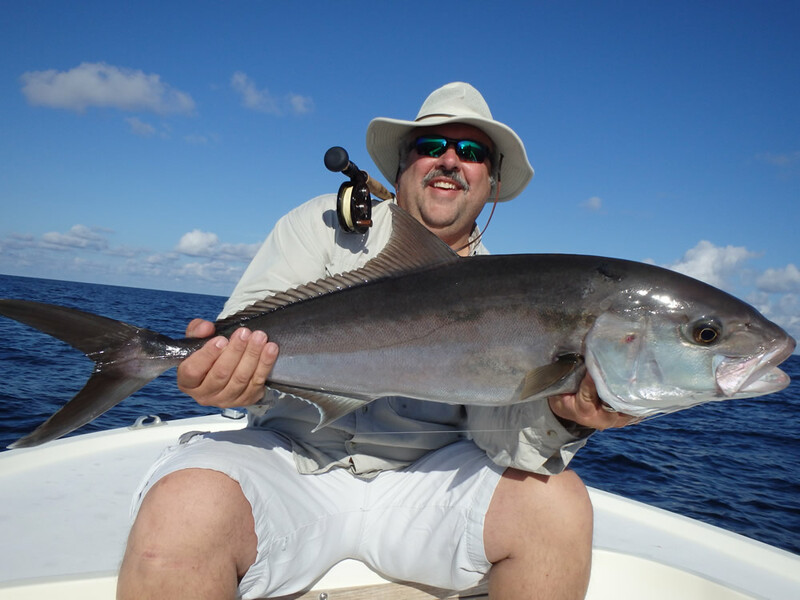 Jim had his hands full using a St Croix "Avid Series" spinning rod that weighs just 4.6 ounces and a Shimano Stradic 2500 with 15# PowerPro. Good job! Jim's fishing buddy David Bruce with another fine black drum also landed on light tackle and a SPRO bucktail jig. 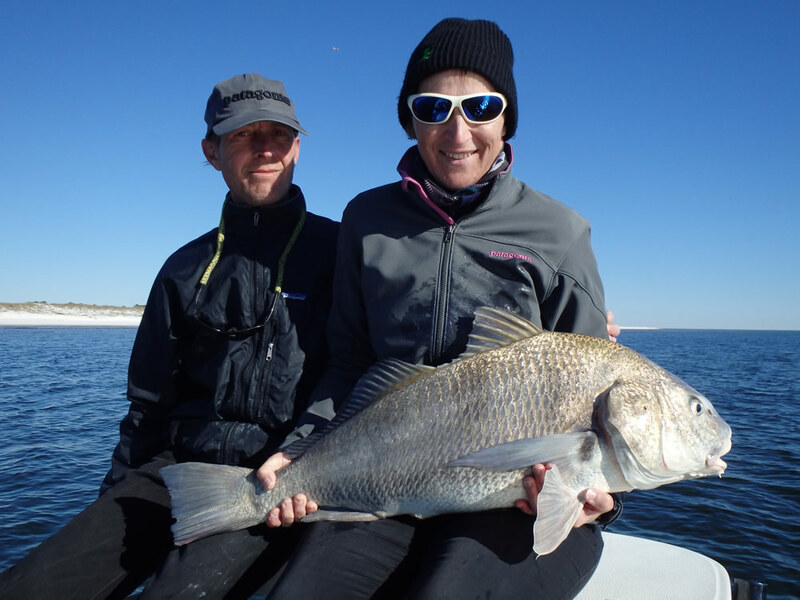 Phil Preston and Cathy Chauvel from France were here on a spectacular January 12, but once again the water was too trashed for sight-fishing. At least the black drum were hungry, and Phil landed the first fish of the day on light-tackle. 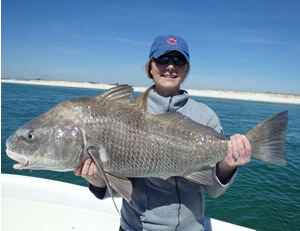 Here's Cathy looking great with her first-ever black drum. 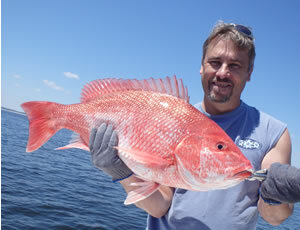 How do you spell "relief" from the muddy waters of Pensacola Bay?? 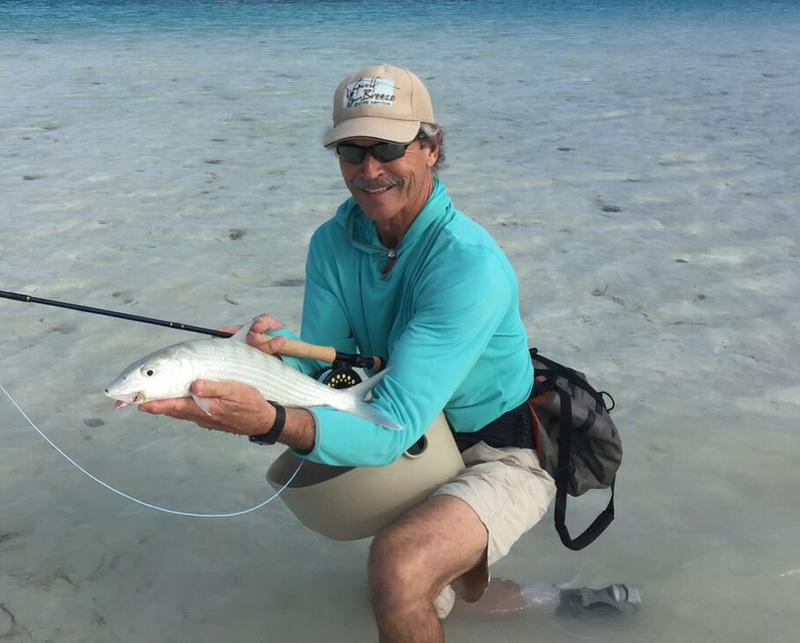 Jonas looking impressively nerdy with his first-ever bonefish hooked in the channel and landed along the sandy beach outside. Nice job, my man! 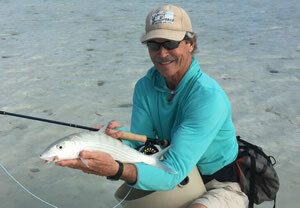 We found decent numbers of good sized bonefish and had a blast....a perfect winter break. Oh yeah... THAT's what I'm talking about! 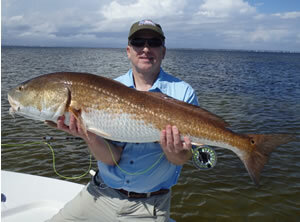 Mark Christopherson on February 1 with the all-time boat record redfish on fly...45" and 35#...landed on 9wt tackle. The water was "chocolate milk" from the rain, but I poled us up on a shallow flat anyway and dropped anchor in 2.7' of water. 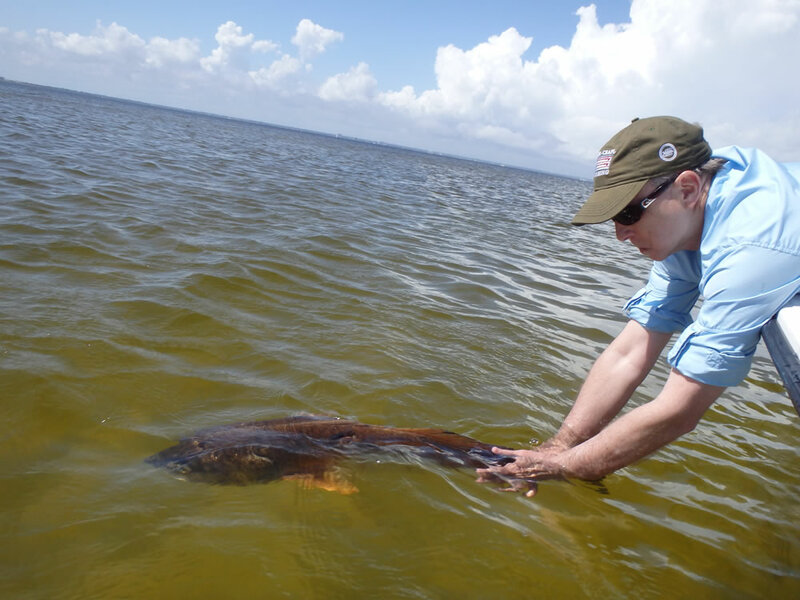 With the bright sunshine I was hoping to be able to detect movement from big redfish in the shallow water, but it was nearly impossible to see anything. We sat there for almost two hours with Mark casting occasionally at the shadows I was most likely hallucinating from the poling platform. 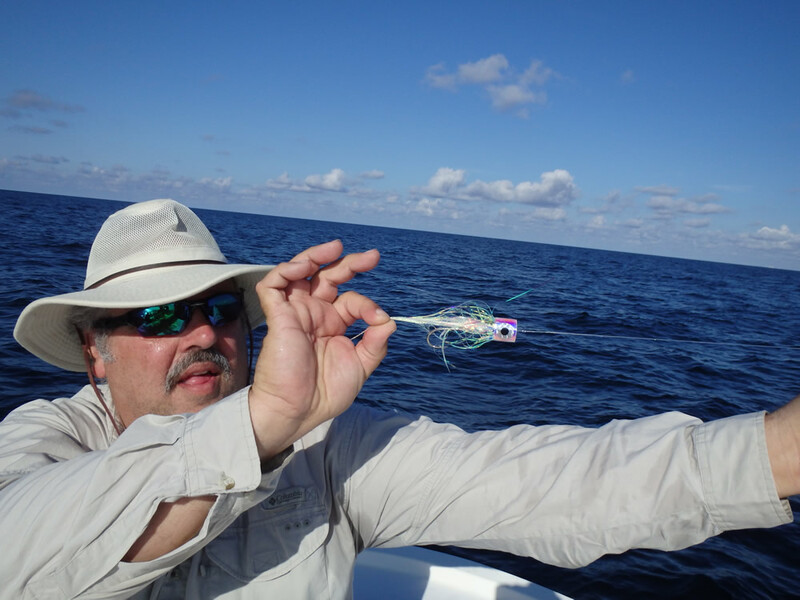 I thought I saw movement that was possibly a school of fish 30' from the boat, and Mark dropped the #2 tan/white clouser right on top of it. 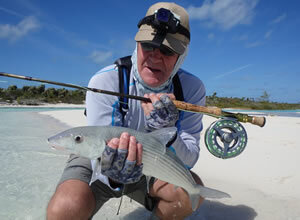 Nothing spooked, and he let the fly sink for a good count of four before executing a long, slow strip. He immediately came tight to a fish and held on as this giant redfish bolted down-current. 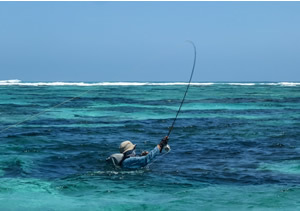 A hundred yards into the backing, and I unclipped the anchor and poled after the fish to keep from getting spooled. 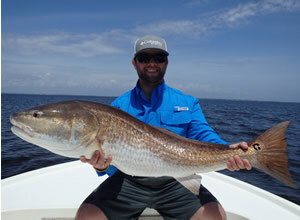 The redfish sensed the change, did a quick 180, and charged the boat. Mark did a masterful job stripping in backing hand-over-hand maintaining the barbless hookset by keeping the line tight. 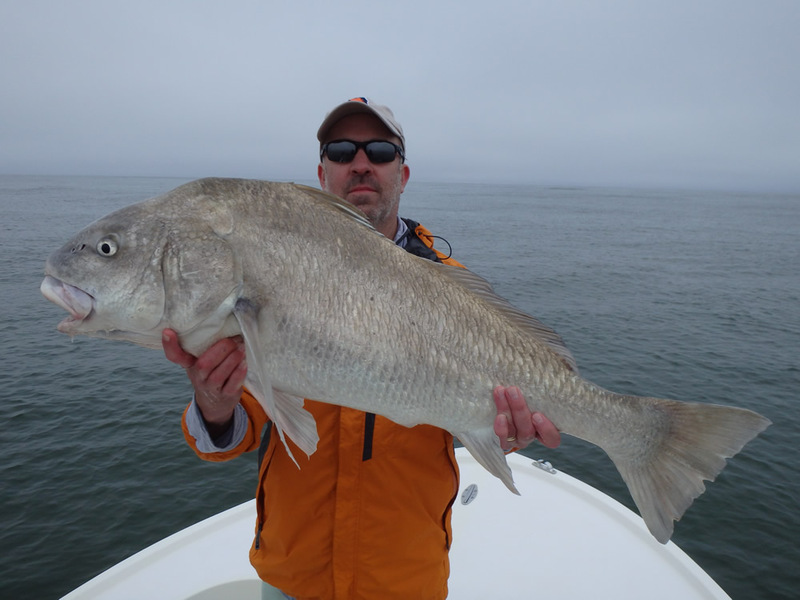 There was more drama when a knot formed in the loops of backing on the deck, and the fish did another 180 and surged away from the boat. 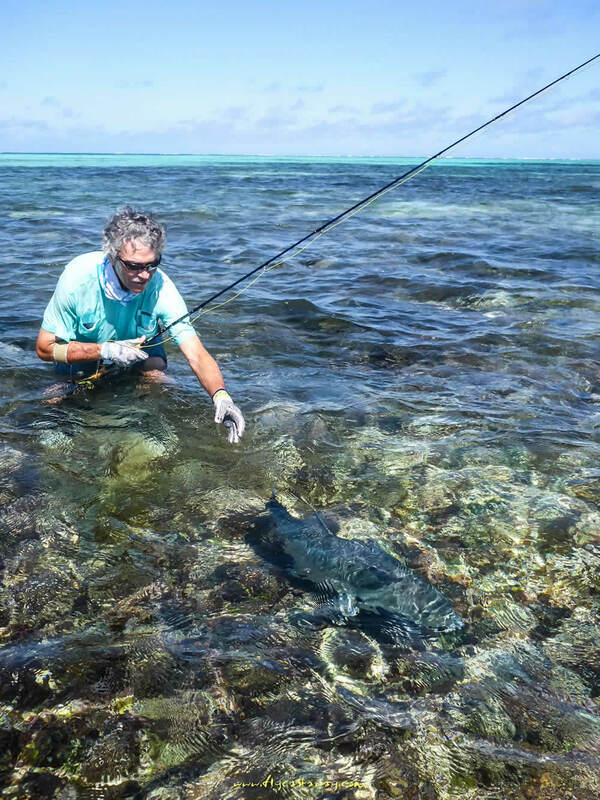 But the knot click...click...clicked through the guides, and after another 20 minutes Mark brought this magnificent fish to the net. 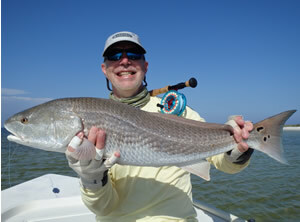 February 18 was a beautiful sunny day, and we hit the Gulf hoping for some shallow-water redfish sight-fishing. But it wasn't to be...water was still too cloudy to see fish. 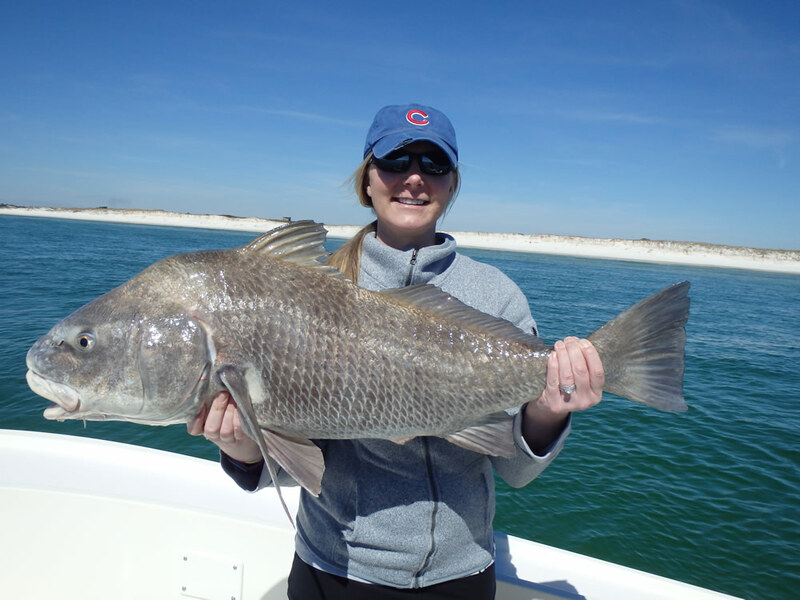 So we tried blind-casting the same area that had produced black drum the previous month, and Ellen Marsh landed the fish of the day. Dennis Farkas took "the boys" fishing on March 22 and gave them a lesson on hooking and landing red snappers on circle hooks in Pensacola Bay. 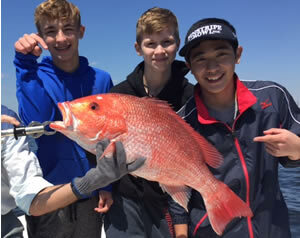 The whole gang of Derek Farkas, Kyle Rogers, and Sam Kido put the heat on this nice snapper which we released unharmed. 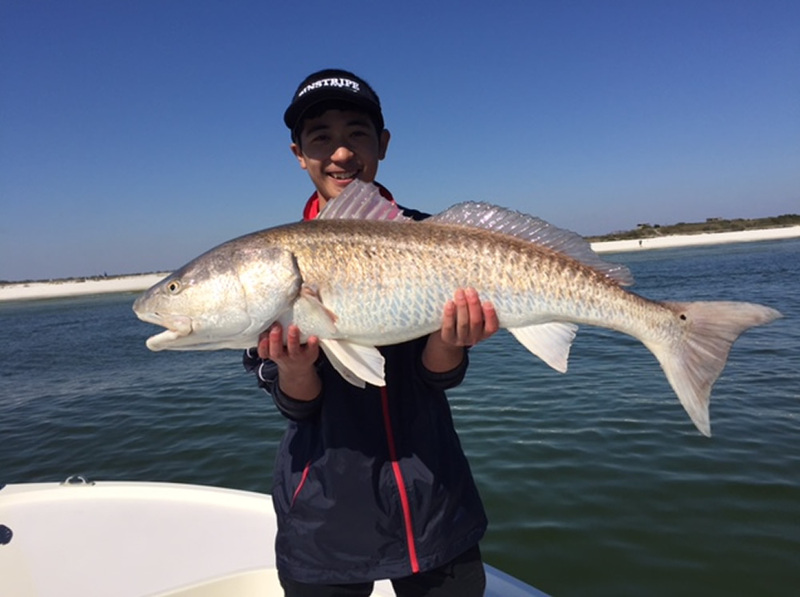 The Gulf of Mexico was finally clear enough for some sight-fishing, and Sam Kido caught this fine redfish on light-tackle. 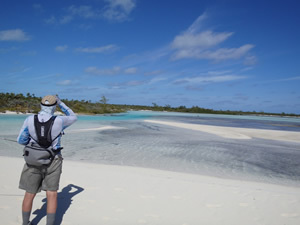 On April 2 I left town for an epic 12 day trip to Providence Atoll in the Seychelles. 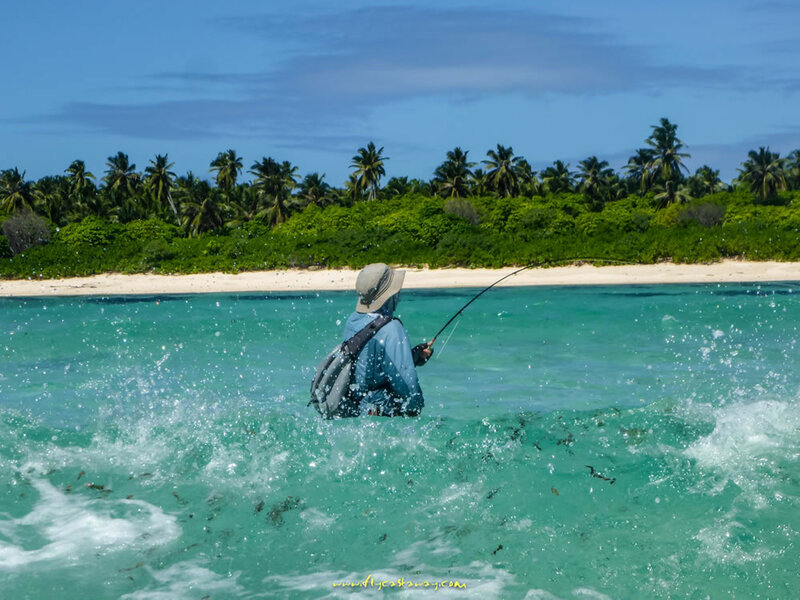 It took 32 hours to reach Mahe, the Seychelles capital, where our group met and overnighted before flying out to Farqhar Atoll and boarding our mothership MY Dugong for the 5hr crossing to Providence. 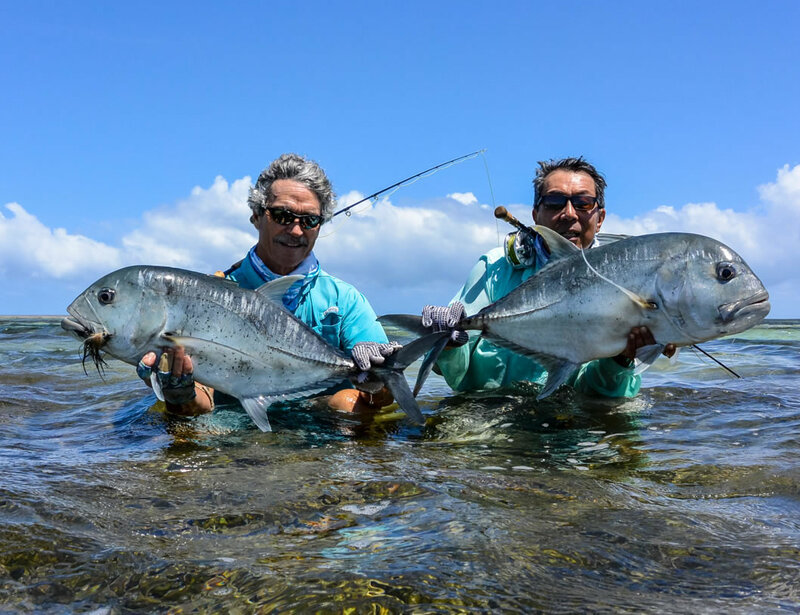 We arrived at sunset exhausted from the journey, but supercharged with the excitement of fly-fishing for giant trevally and other species on some of the most remote flats in the world. The four outstanding guides from FlyCastaway (www.flycastaway.com) checked over our gear that night, and we were ready to hit the flats at 0730 the next morning. 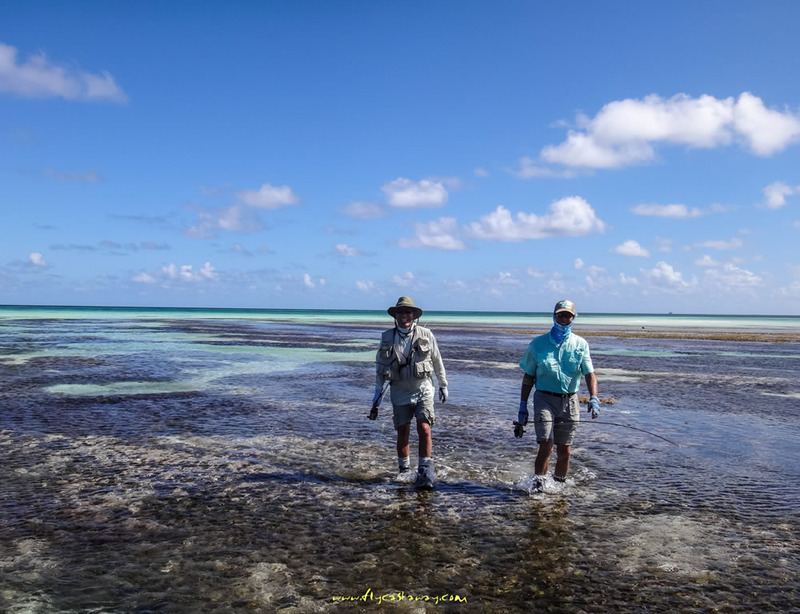 We spent the next 6 days wading the turtle grass flats in knee to chest-deep water armed with 12wt tackle sight-fishing for GTs. Of course there were other predators hanging around the coral outcroppings, and they were eager to crush our brush flies. 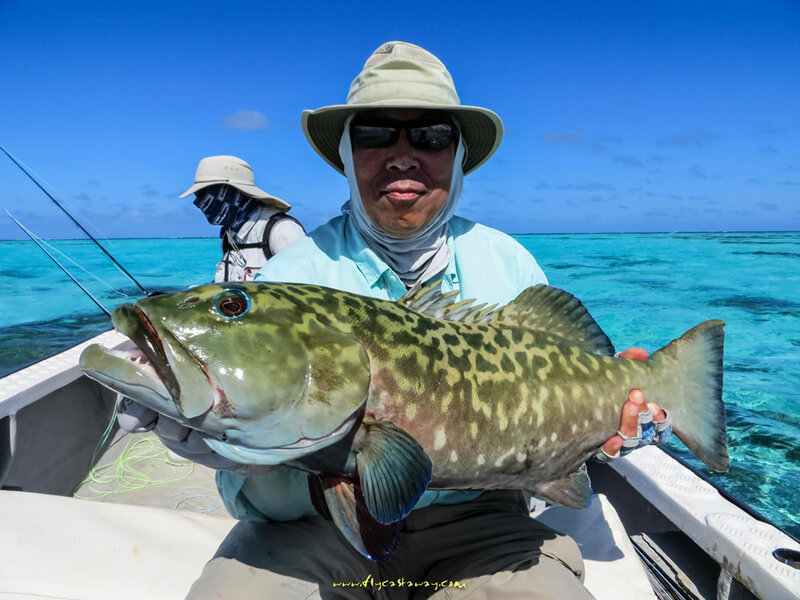 This grouper is similar to the gag groupers back home. 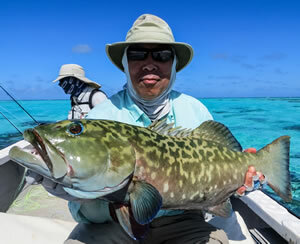 My fishing partner Tij with an incredibly beautiful grouper landed and released unharmed. 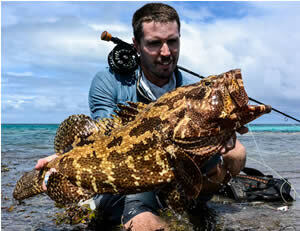 How's this for an amazing grouper! 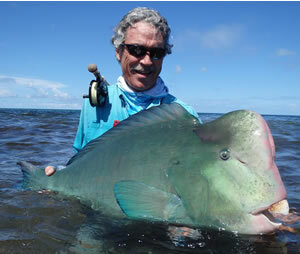 David from South Africa landed this remarkable fish. 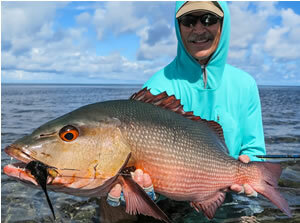 First fish of the trip for me...a bohar snapper that almost snatched the rod out of my hands. 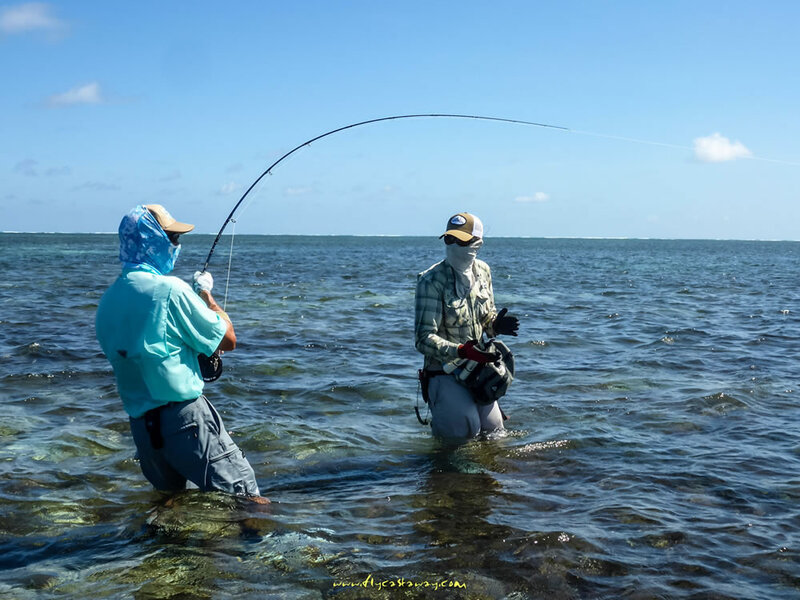 We were in waist-deep water approaching a large coral mound when baitfish started showering. 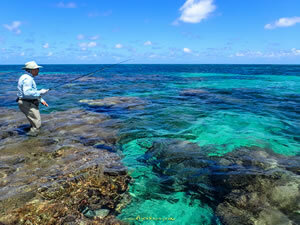 Expecting GTs I laid the fly out there and came tight to a big fish that surged for the coral. It took everything I had to stop the fish before it reached the rocks and cut me off. I was very happy to be armed with my 12wt Sage Xi2 and Tibor Gulfstream! 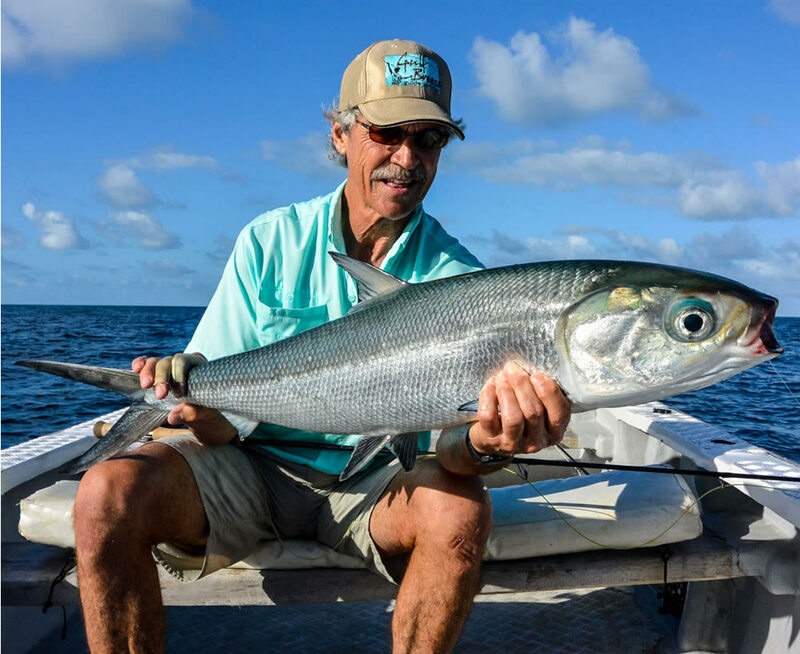 Landed my first-ever milkfish at the end of the second day on a little green algae fly, 10wt Sage ONE and Tibor Everglades. Very cool experience. 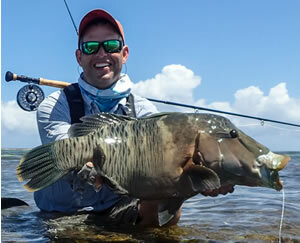 Guide Matthieu Cosson estimated the weight at 16 pounds. 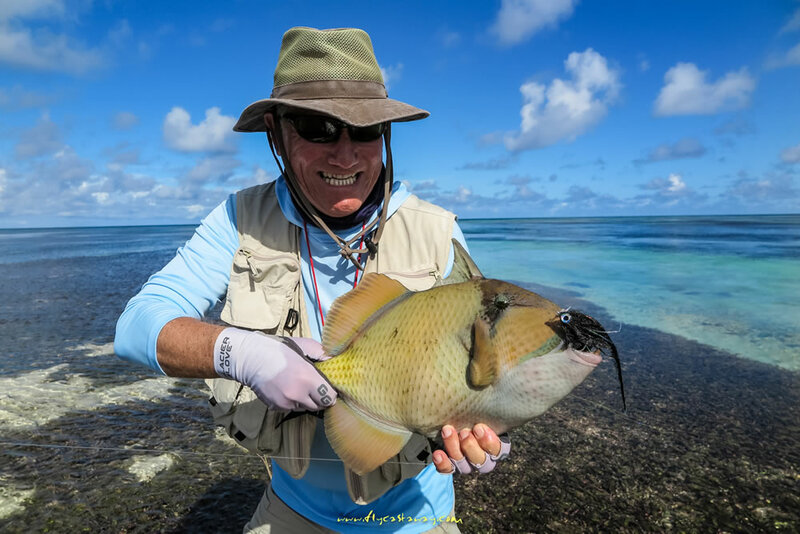 By the third day I still didn't have a GT under my belt but landed this 40 pound bumphead parrotfish on my 9wt "ONE", a crab pattern, and 20# tippet with a wind knot! 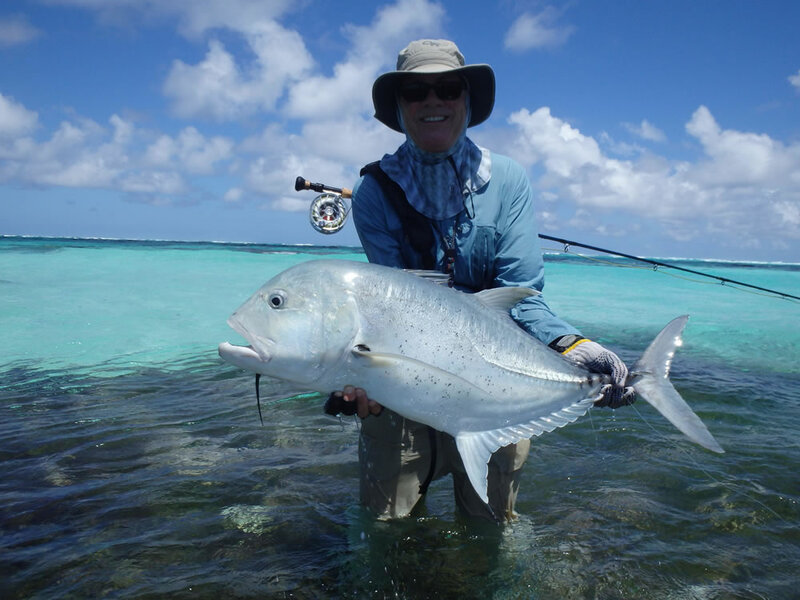 Very lucky to have landed this fish... There were only three caught all week. 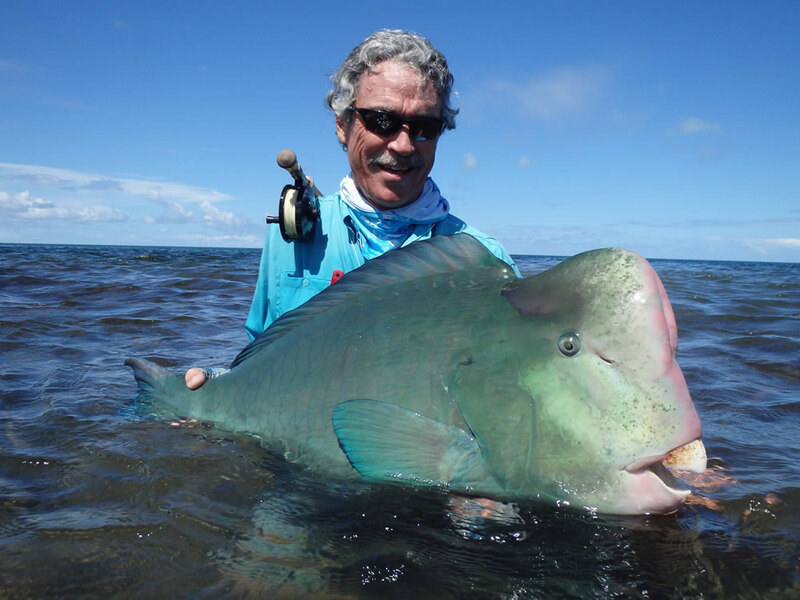 Michael Collins with a rare Napolean Wrasse. 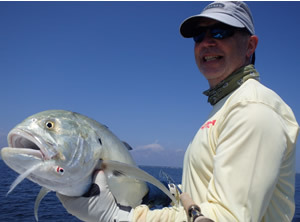 The fish took the fly and bolted for his "hole" while the guide yelled "Stop him! Stop him!" 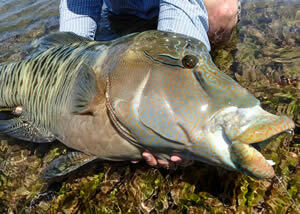 Of course the wrasse was unstoppable and dove down into the safety of his 4-5' deep hole. 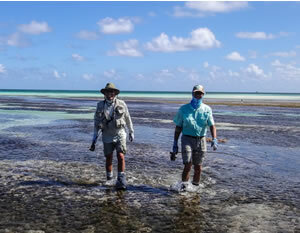 But our guide went in after the fish and dragged it out tail first! Very impressive. 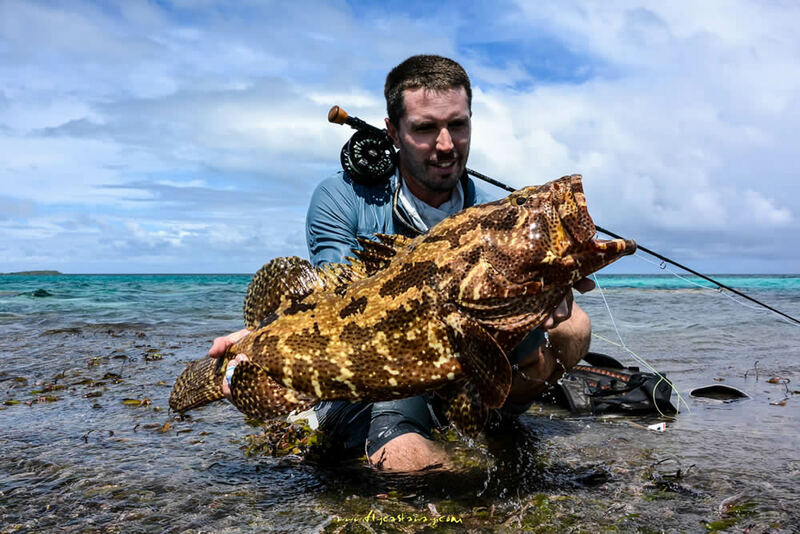 Check out the colors of this magnificent fish. 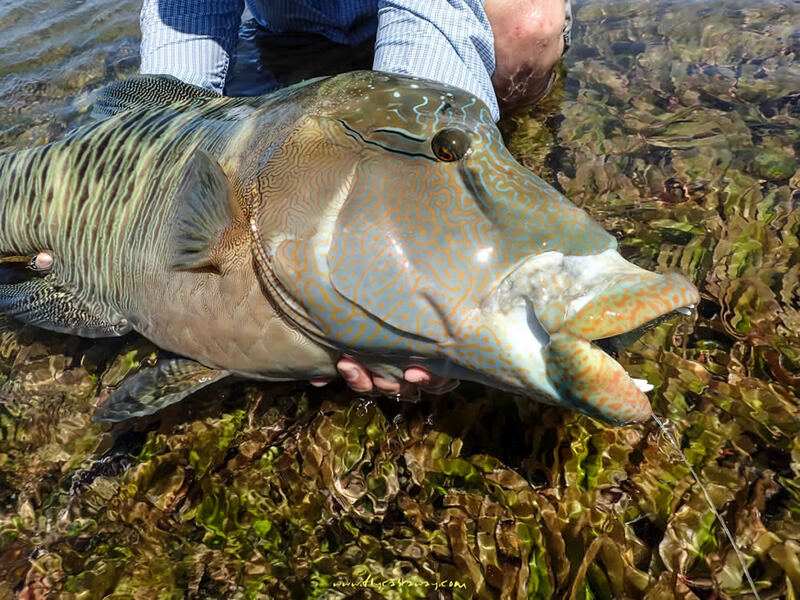 Talk about a beautiful fish! 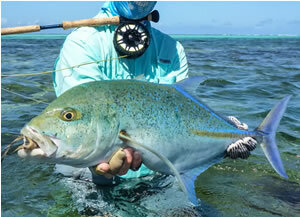 The bluefin trevallies in the 5-10 pound range were plentiful and eager to take our flies. One fish inhaled the fly so deep it wasn't going to survive, so we had it for sashimi that evening...best I've ever had. Big Duke and the famous pose with another trigger. BIG also landed the biggest GT of the trip...97cm. 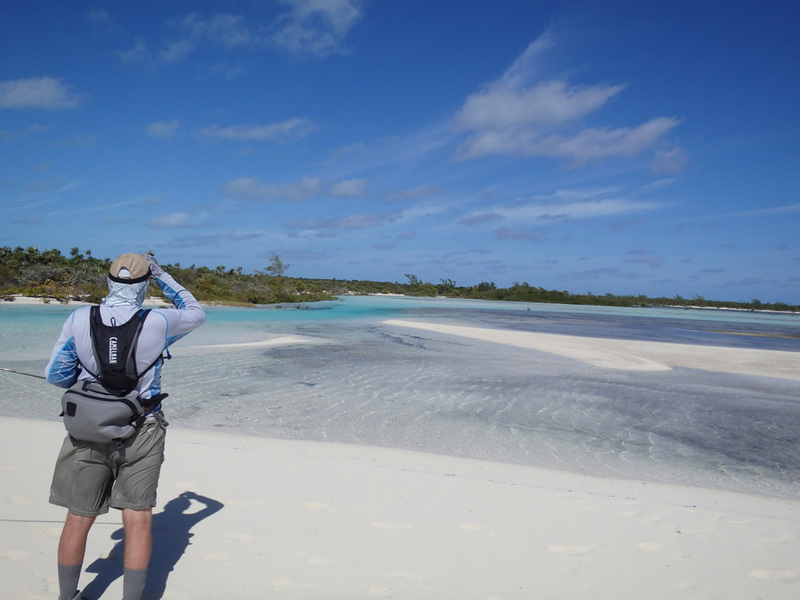 Tij poised on the coral ready to ambush a GT in the sand channel. Double click for a better view of this beautiful spot. 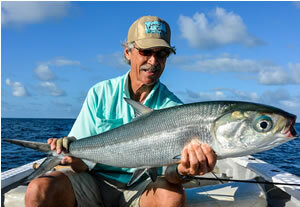 Duke hooked up to a GT in the surf with the tropical island in the background. How could it get any better??! 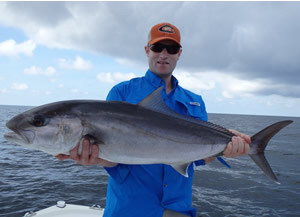 I'm hooked into my biggest GT of the week landed on the final day. 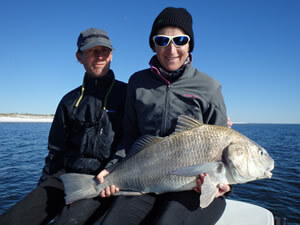 The fish was 94cm long and weighed 35-40 pounds. 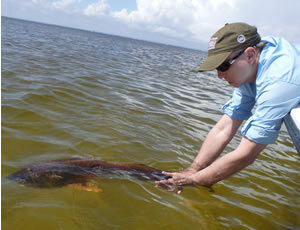 And the release. 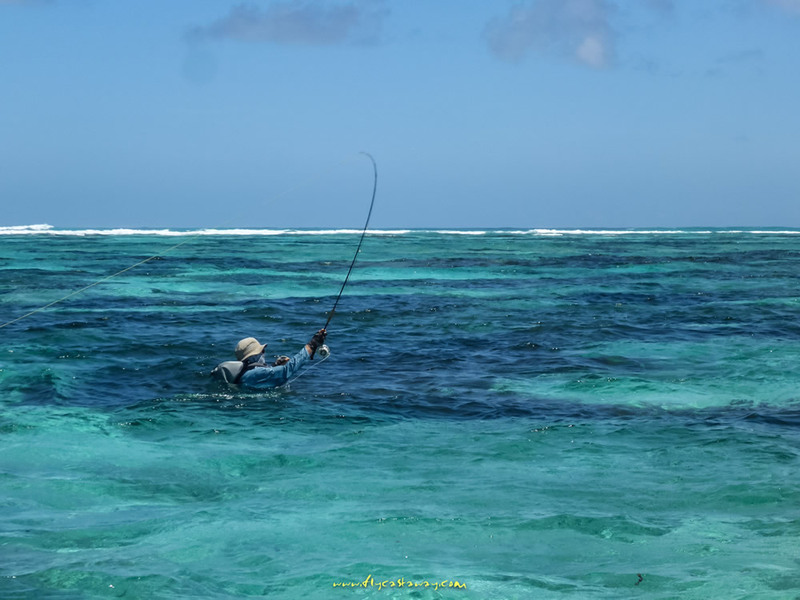 As you can imagine, a GT sitting still over turtle grass is pretty difficult to see making for some very interesting sight-fishing. 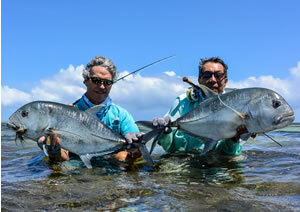 A GT double for Tij and me. Duke with one of the three biggest GTs of the week...95cm. Mike Youkee with a brute. Here's looking at you, kid. Mike and I at the end of the morning session heading for lunch on the skiff. Six hours later that water would be 6' deep! 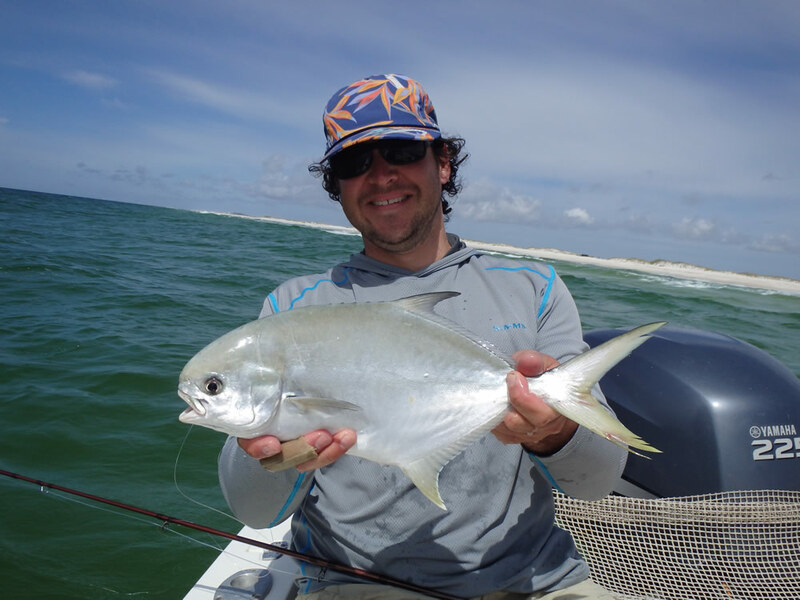 It was back to reality on April 20, and "Wink" Winkleman landed and released this lovely pompano along the shores of the Gulf Islands National Seashore. 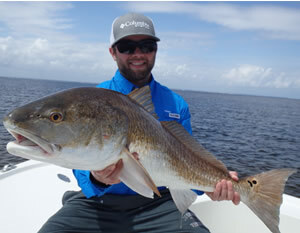 On April 21 Greg Trumbull was blind-casting a gold sidewinder spoon in a "Honey Hole" in Santa Rosa Sound when this impressive redfish nailed it. That's a lot of fish on 15# braid and a little Stradic 2500! 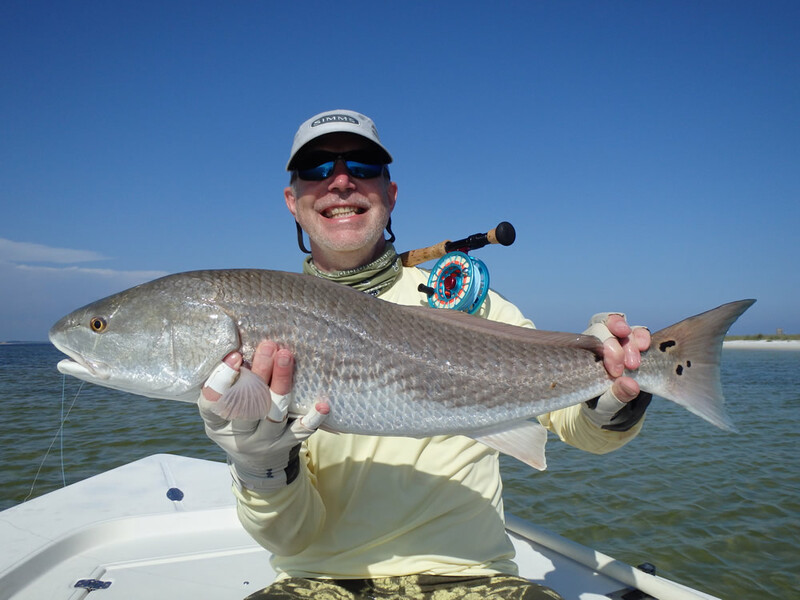 We always replace the treble hook with a large single hook and mash down the barb to keep from harming one of these magnificent redfish. 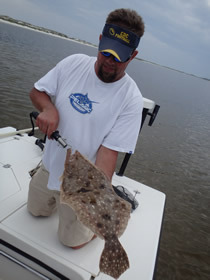 We thought it was a fluke until Greg got another take a few minutes after landing the first redfish. 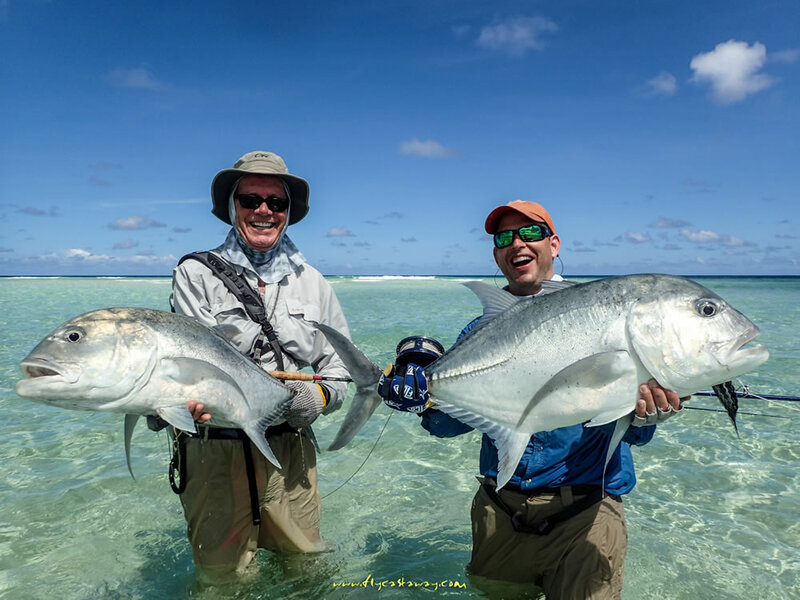 Turns out there was a school of the big fish living in the area, and we had a blast with them for the next couple weeks...on both spin and fly. 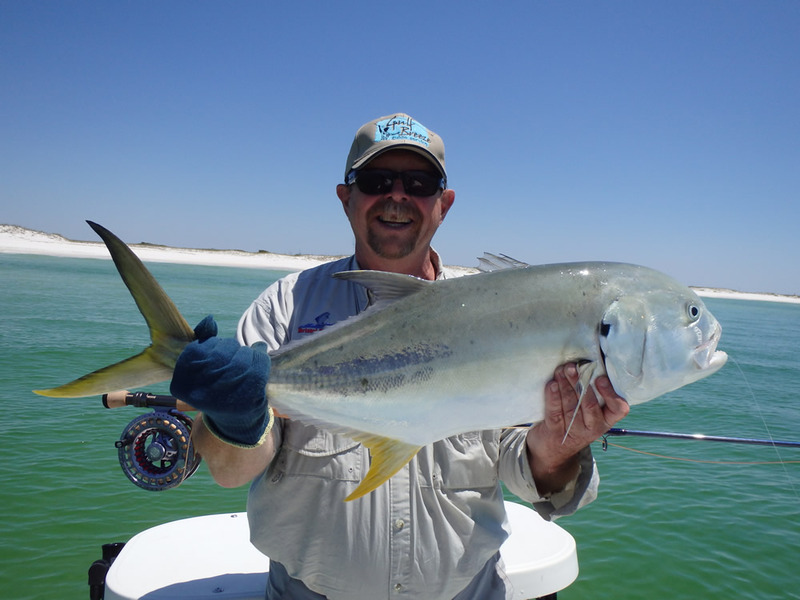 Kent Gilliland was on the boat April 22, and we found some of the bulls in less than 3' of water a few hundred yards where they had been the day before. 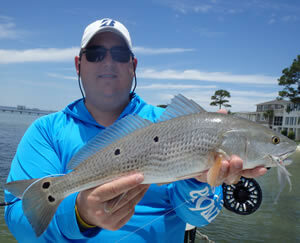 Kent dropped the tiny Sz 4 EP clouser minnow a couple feet in front of this fish, and the redfish nailed it. 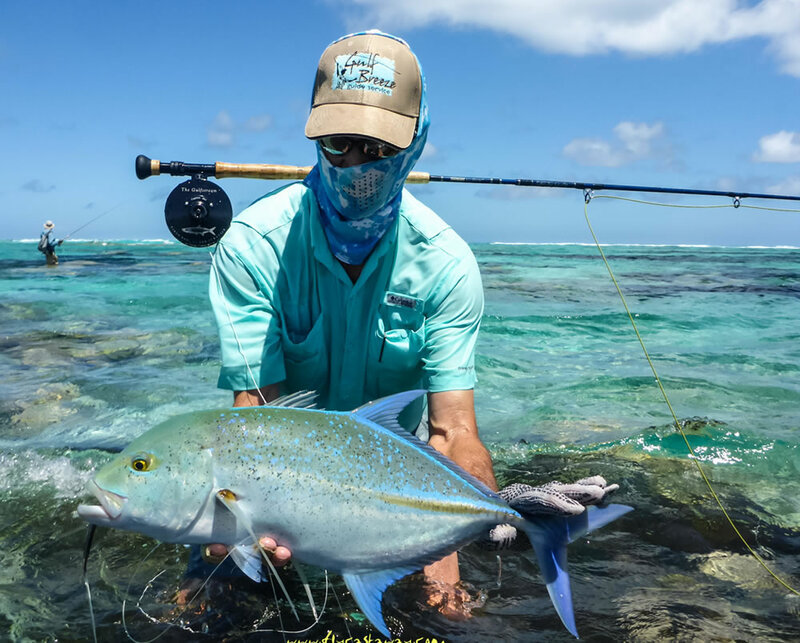 Very satisfying for Kent to land it on an 8wt he built himself. 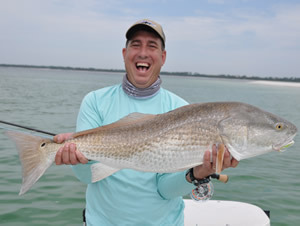 Kent with a more "typical" flats redfish from that remarkable day...his fourth or fifth. 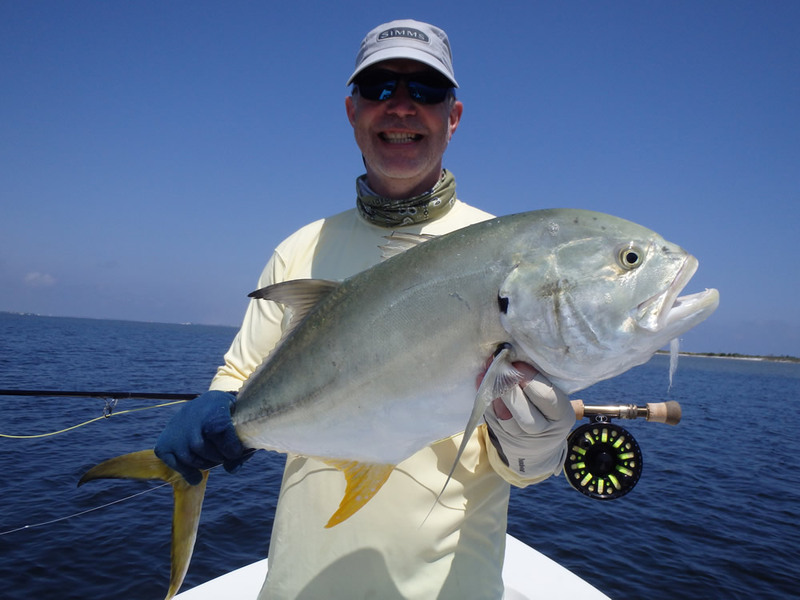 Dennis Farkas on May 3 with a very respectable jack crevalle....pound-for-pound one of the hardest fighting fish in show business. 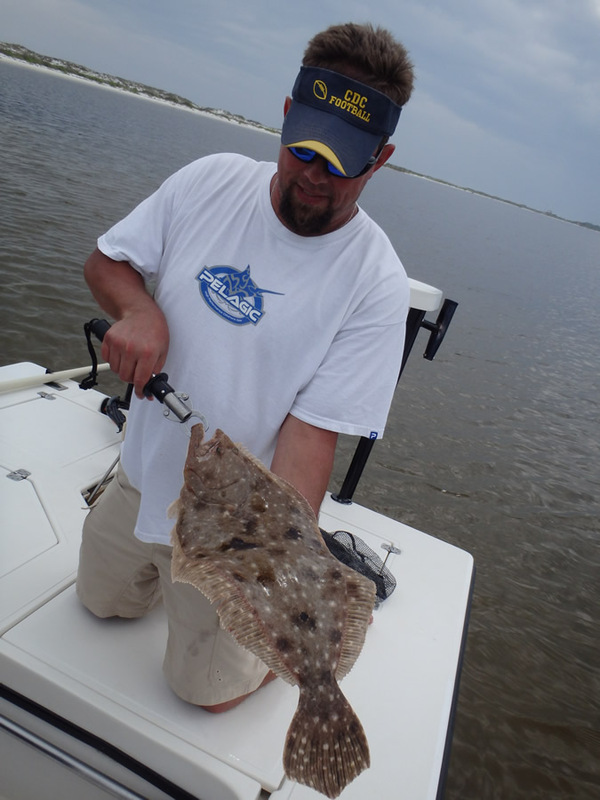 Jay Pippen on May 3 with a doormat flounder landed and released to fight another day. 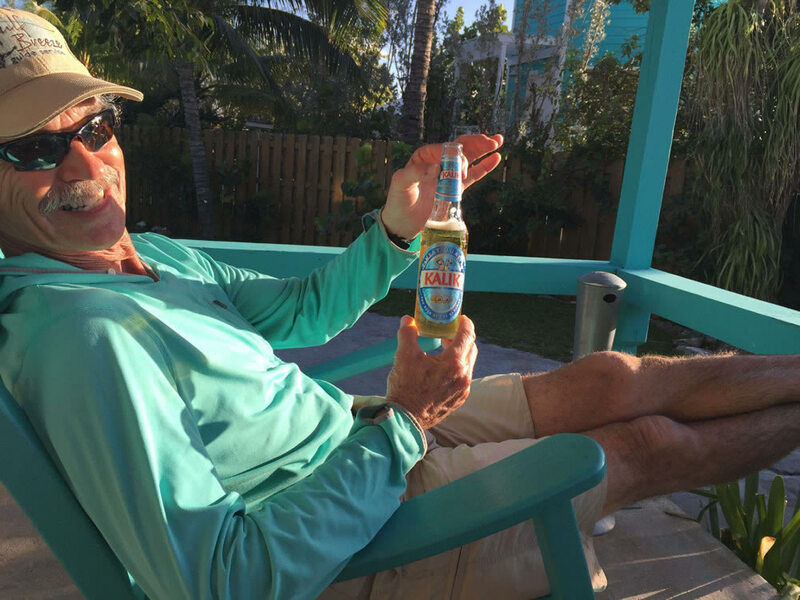 Good Karma, Jay! 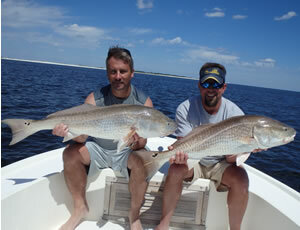 We ended the day with a nice redfish "double" in Pensacola Pass. Nice work, guys. It's just the second time in 13 years that anyone has achieved The Slam on my boat, and it takes both skill and luck to bring it home. 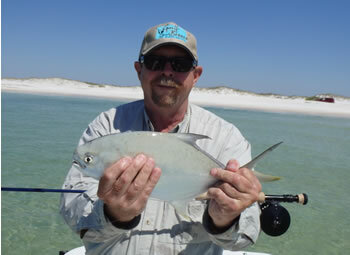 Bob Jenkins, Woody Creek, CO, had never landed a pompano on fly until the morning of May 7. 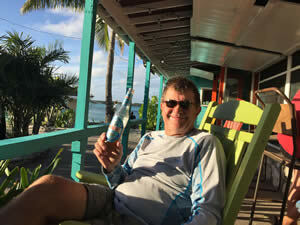 We anchored just inside the inner bar on a "bluebird" day with a gin-clear Gulf of Mexico. 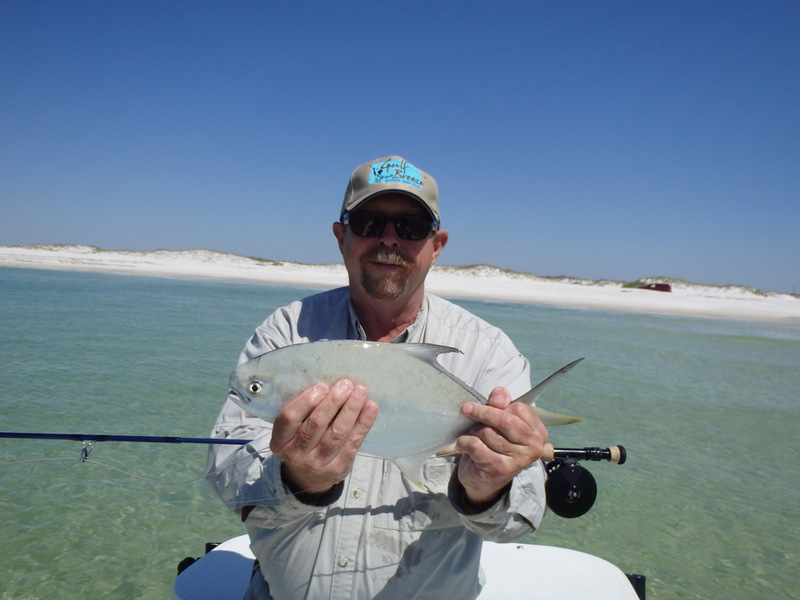 Our expectations were high, and Jenkins had three rods ready their lines dangerously coiled in various places on the skiff...one for pompano, one for redfish, and the third for jacks. 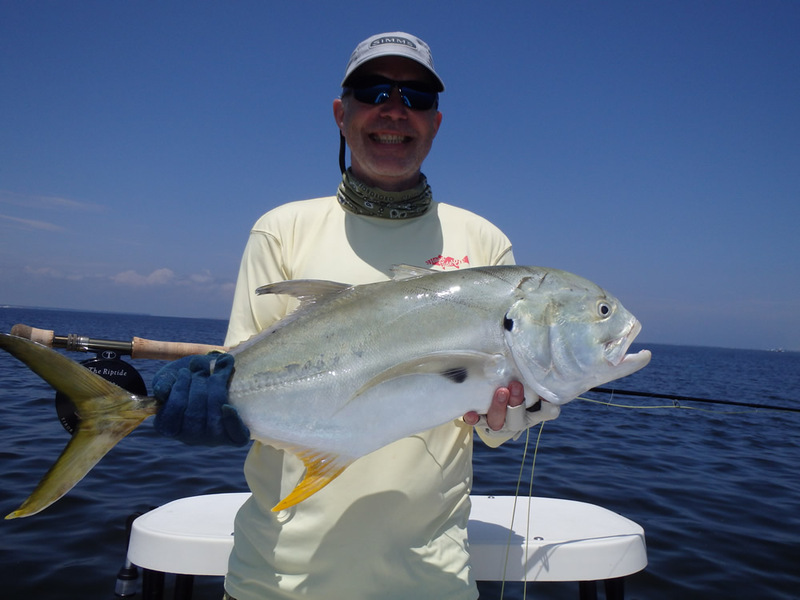 Bob was holding the pompano rod with a little yellow pompano fly when a pair of nervous pompano appeared darting nervously left and right. 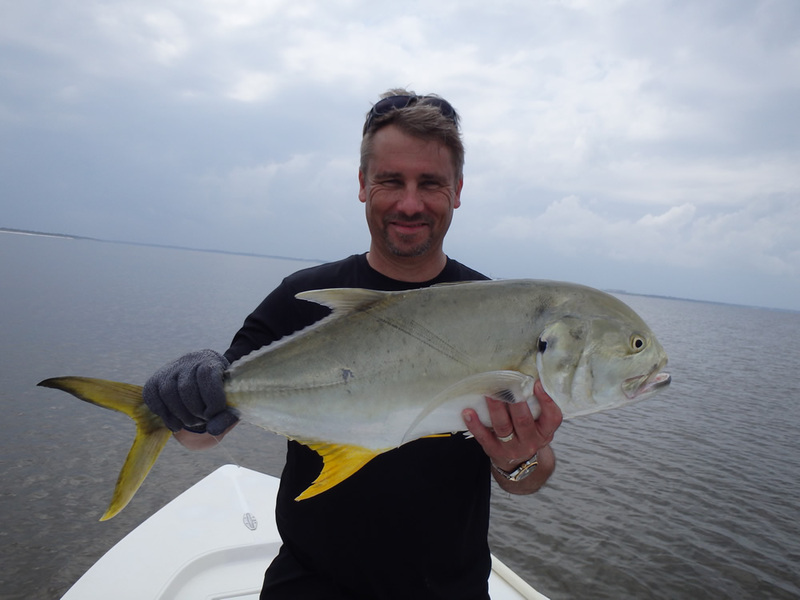 He kept his cool, waited for the fish to pass the boat, and laid a cast out in front of them. 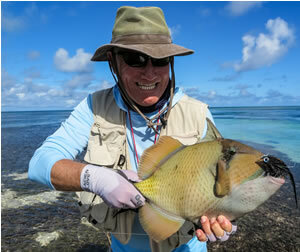 This fish simply swam over and ate the fly with no hesitation. 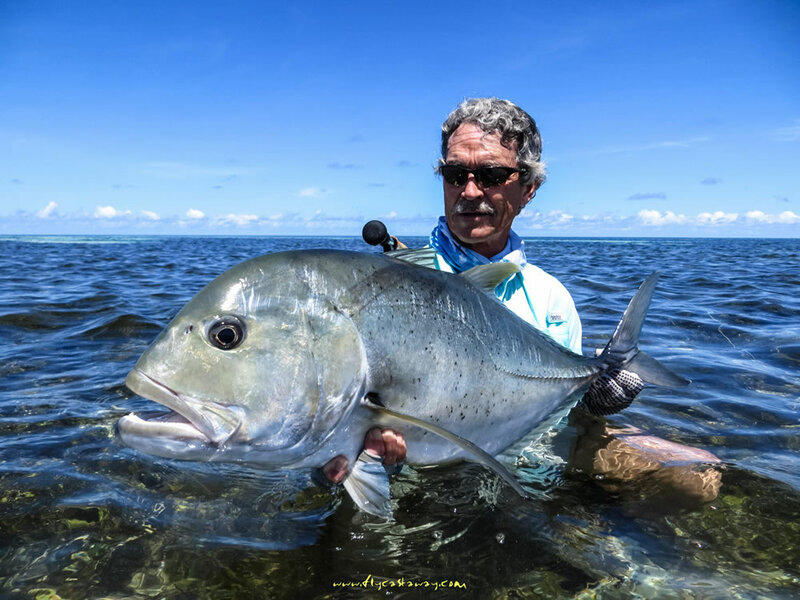 And just like that Jenkins was off his lifetime pompano "schneider"... We knew there were other species to catch but felt good about our spot and decided to sit there a while longer and see what swam by. Out of the corner of my eye I caught movement in the dark water 150' outside of us and realized a big school of jacks had passed us heading west. Pandemonium ensued as we stowed the other rods, unclipped the anchor, and sped away to get in front of them. 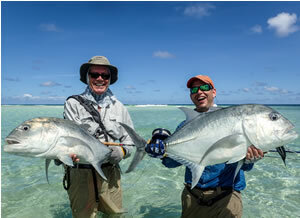 This was a huge school of a few hundred fish, and they were just as happy as they could be. 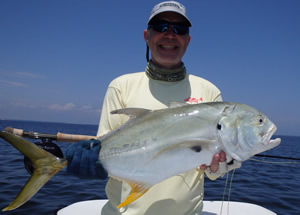 Bob put a short cast into their midst and about thirty of them tried to eat the big white popper. 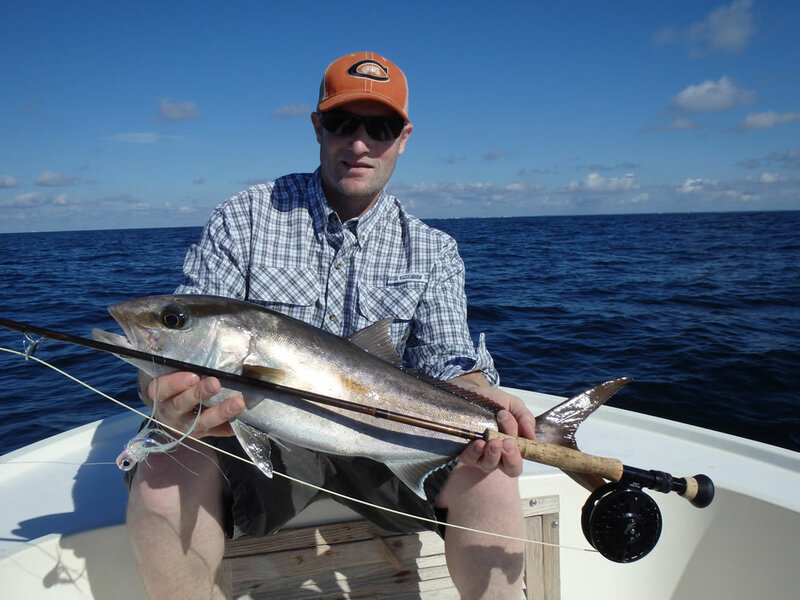 Jenkins strip-set perfectly and after about 25 minutes brought this jack to the net. Two down on The Slam and it wasn't even noon! 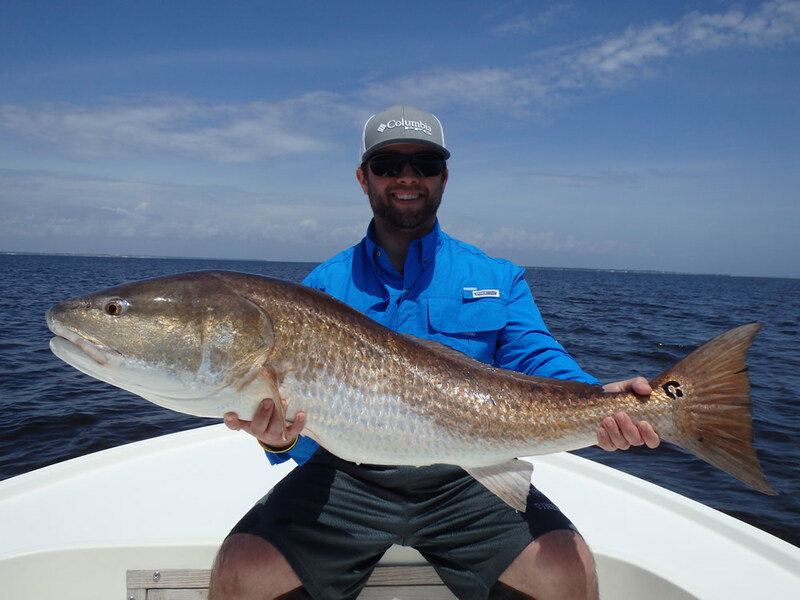 Since he had lost a nice redfish in the same general area the previous day and we were seeing numerous reds in the surf, Jenkins wanted to clip back to the anchor and stay where we were until the wind shifted to the south....which happened in an uneventful 30 minutes. 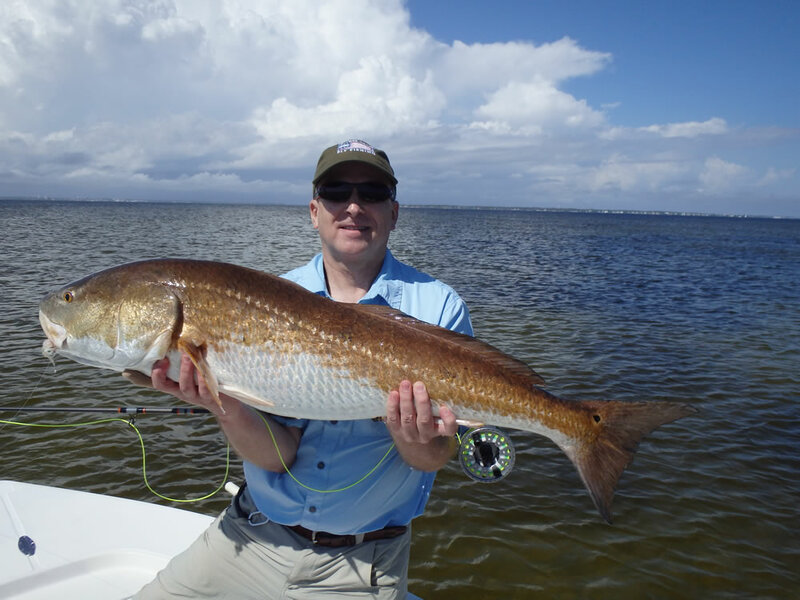 Having been burned numerous times trying to get the third leg of The Slam my plan was to devote the rest of the day hitting all my favorite redfish spots on the N side of the island and fish until dark if necessary. 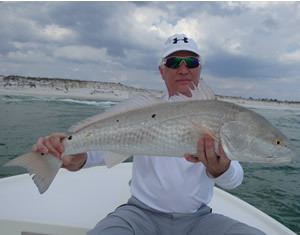 The first spot was a small depression ten feet from shore on one of our favorite flats. 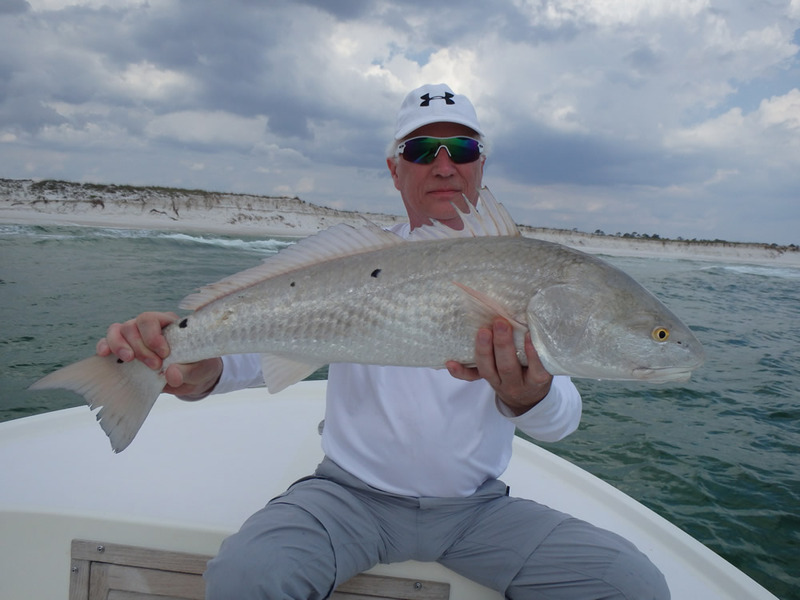 I'd seen a few reds there a couple days before, and the conditions were perfect for sneaking up on it...light offshore wind and water that was cloudy from the N wind earlier in the day. 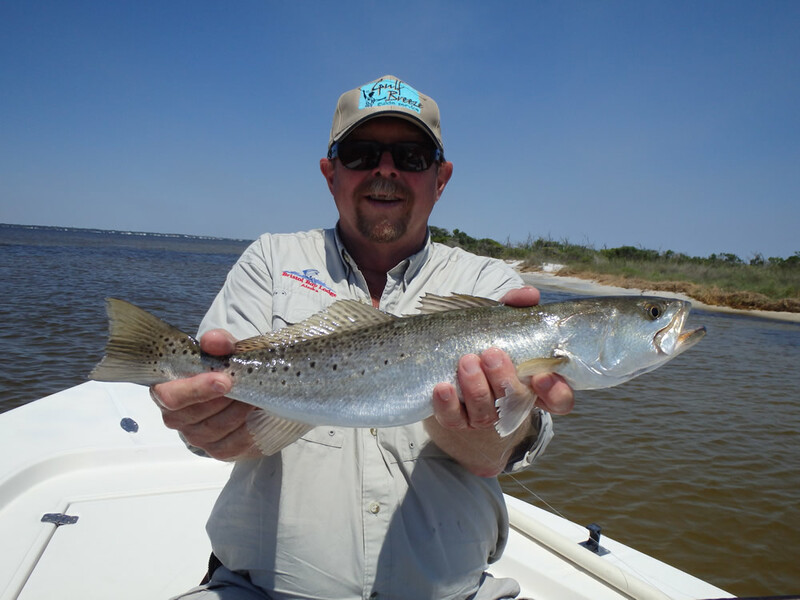 I tied on a "beat up" EP clouser that had caught a couple dozen redfish and even put a drop of LOON Knot-Sense on the leader knots just in case... We eased silently along the shore and positioned the boat where Bob made a nice cast dropping the fly into the depression. 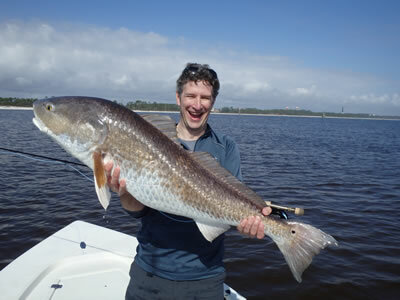 A couple long strips and he came tight to a fish which we quickly realized was the redfish we were looking for. Paydirt on the first cast, and that was that! 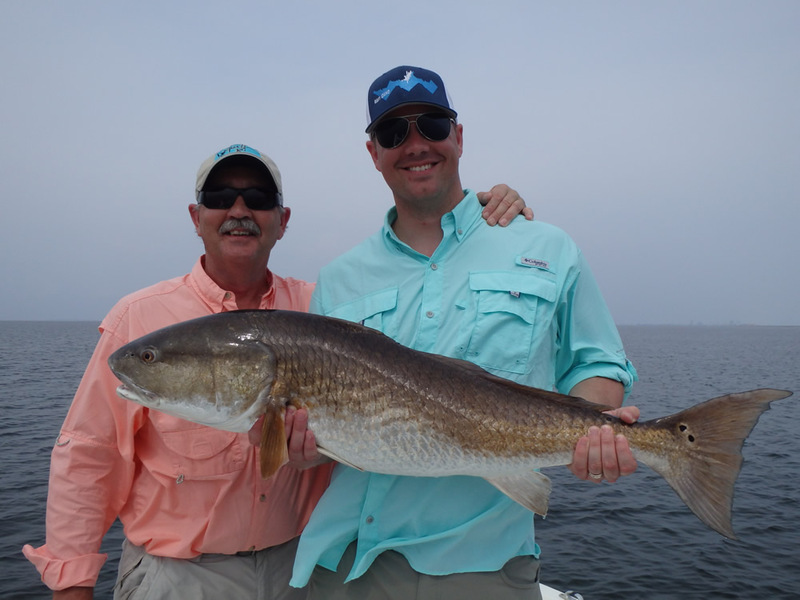 Hearty congratulations to Bob Jenkins who joins Kevin Maxey in the ultra-exclusive Emerald Coast Grand Slam club! 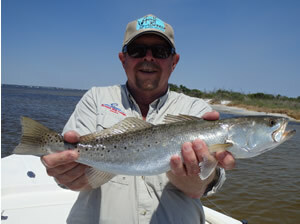 We hung out around the little depression for a while and Jenkins added this nice trout to the day's tally. 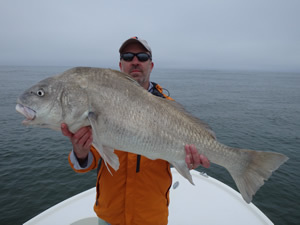 On May 9 we found the school of bull redfish from a couple weeks before on a shallow flat in 2-4' of water. 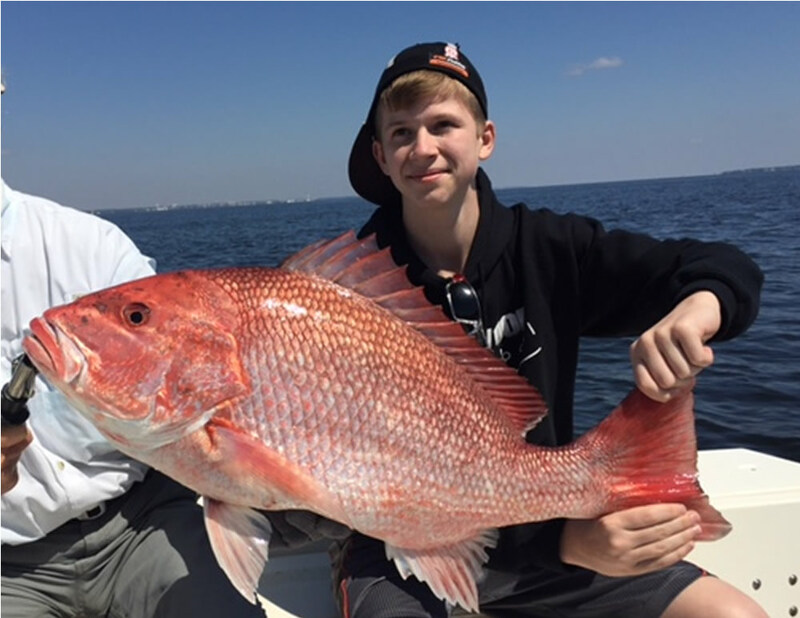 Ronnie Johnson from Montgomery, Alabama, was on the boat with son Brian who'd given him the trip as a Christmas present. 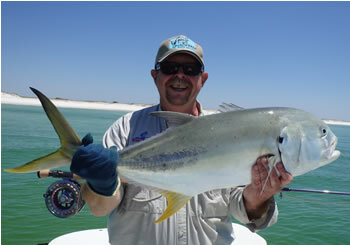 Ronnie's an experienced freshwater fly-caster, and this was his first saltwater trip. 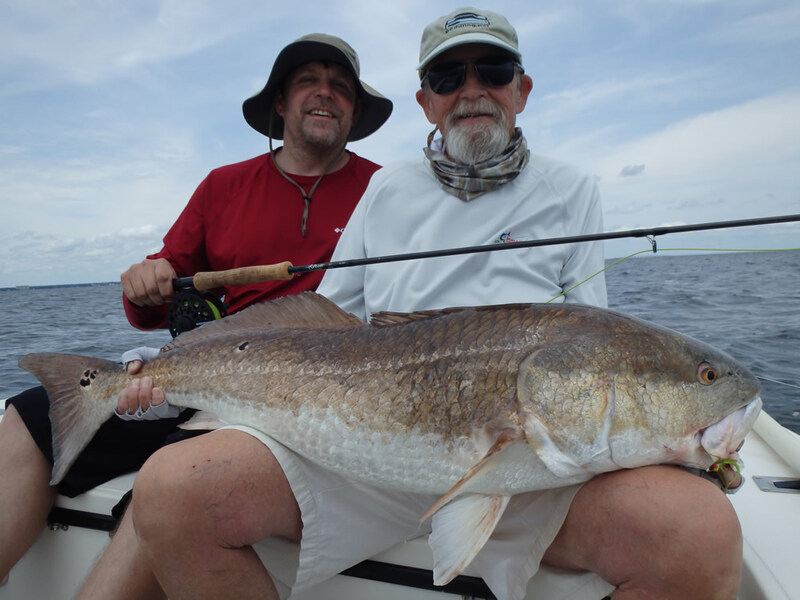 When we found the redfish Ronnie quickly hooked into a big fish on one of his own hand-tied clousers. The fish exploded away bloodying Ronnie's knuckles on the first run which went well into the backing. 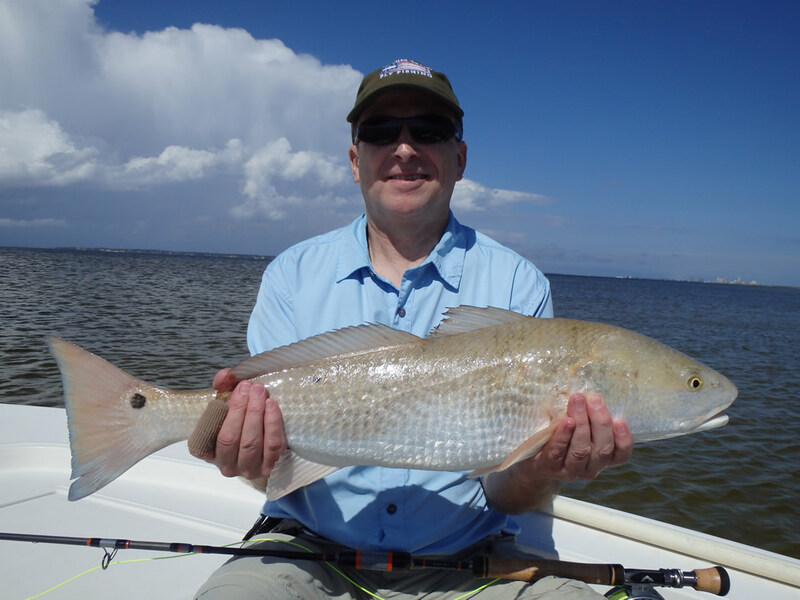 The small-arbor reel on his little 8wt was screaming, and I was scrambling to unclip the anchor when the hook fell out... As he was cranking in the backing and fly line more huge redfish appeared under his line, and Ronnie let the fly drop in their midst while twitching the rod tip to give the fly some life. This fish grabbed it, took off, and I knew we were in trouble. 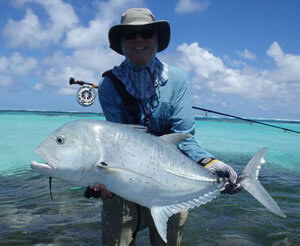 Ronnie only had 100 yards of backing and this was a 30# class fish, plus we were only using 15# tippet! A half hour into the fight the fish had pulled us close to shore into water that was barely 2' deep, and I jumped overboard with the net but the fish bolted when my feet hit the bottom. 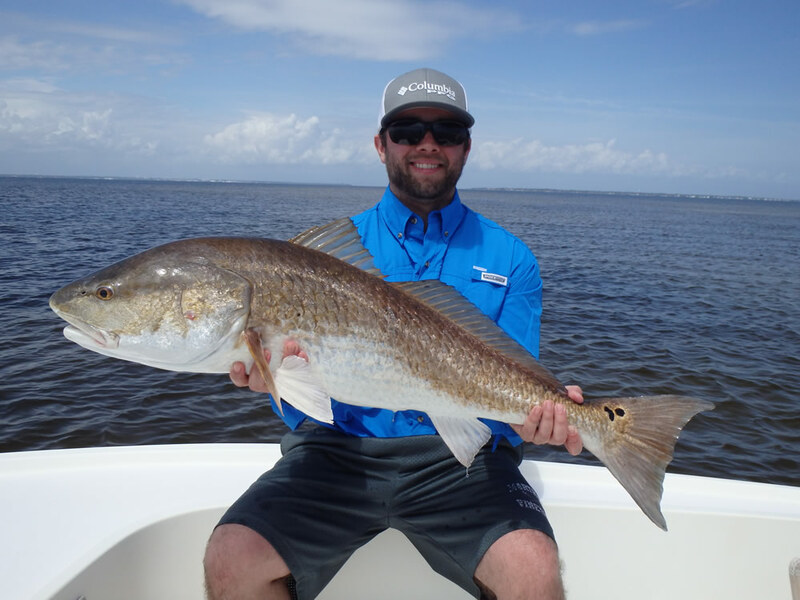 Ronnie fought the redfish like a magician, and in another hour we landed it a mile away in 25' of water...that's a 90 minute fight on an 8wt! 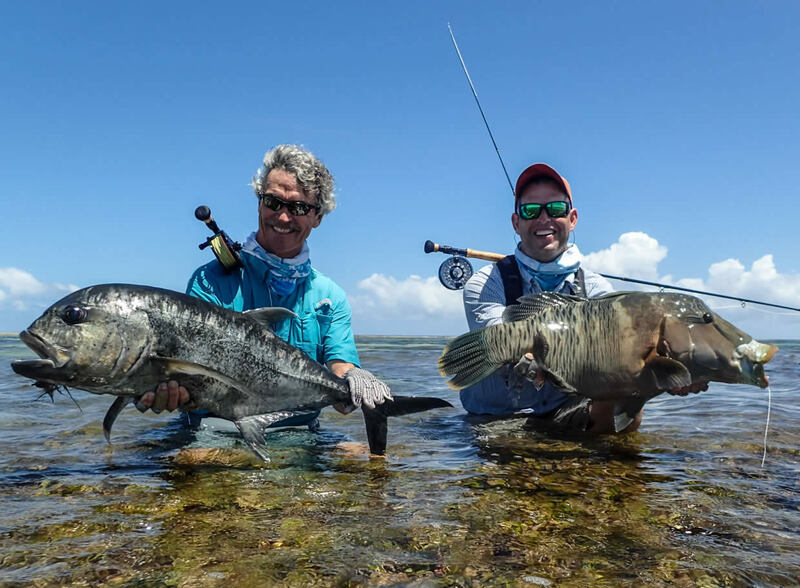 The fish weighed 28 pounds... an epic battle we'll not soon forget. 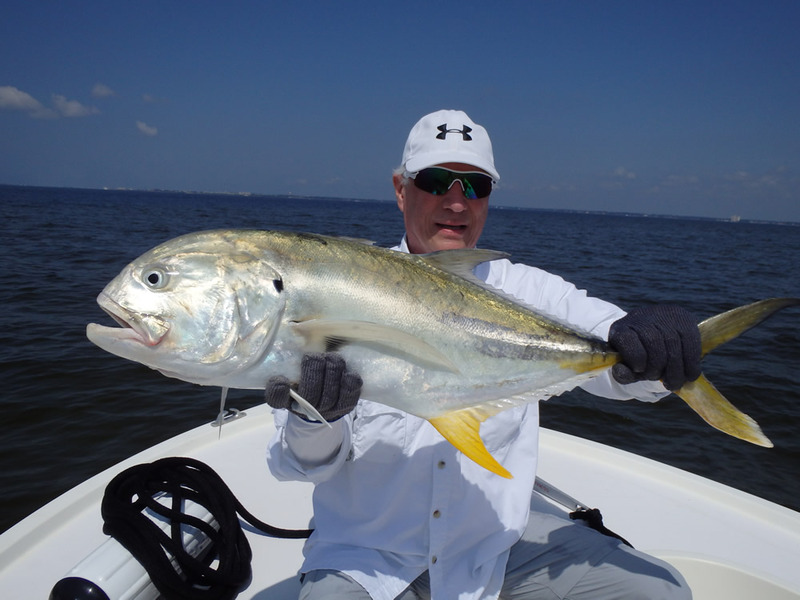 Here's a fine shot of Sandy Loveless on May 13 with his first jack crevalle of the day landed on a topwater plug while sight-fishing in Santa Rosa Sound. 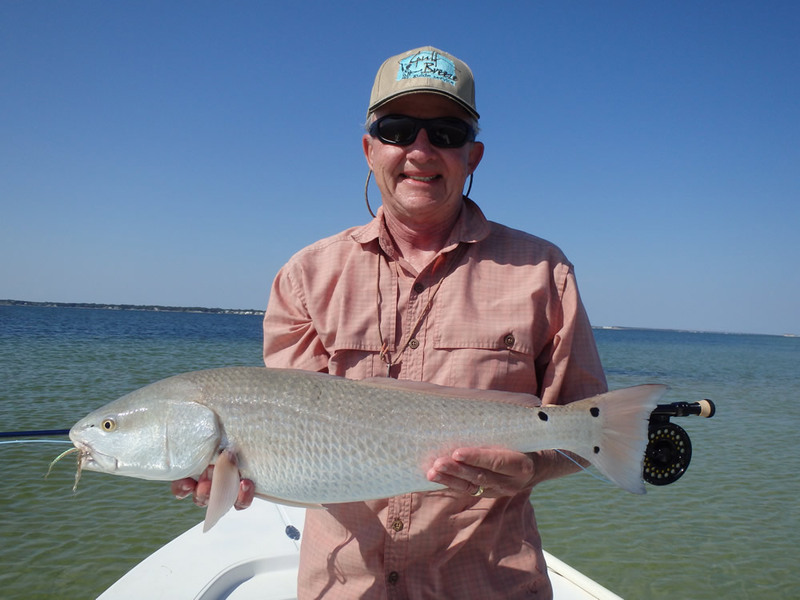 We ran out to the Gulf and found clear water and a school of about 30 redfish working eastbound along the shore, and Sandy coaxed this fish to eat a SPRO bucktail jig. 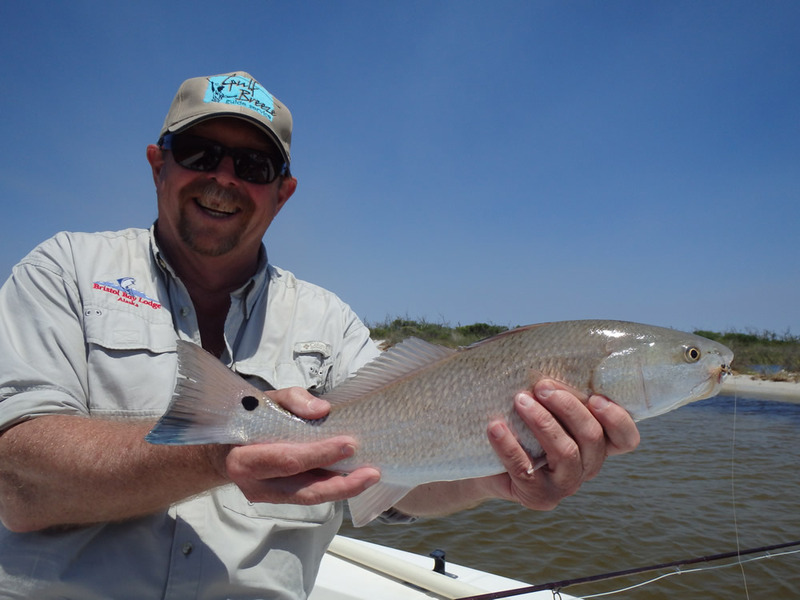 This is the typical color of the redfish living on the white-sandy bottom. 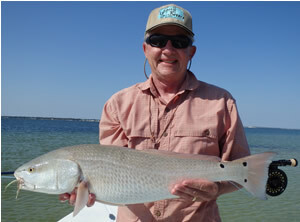 Johnny Gray came all the way from London to try to catch his first redfish on fly. 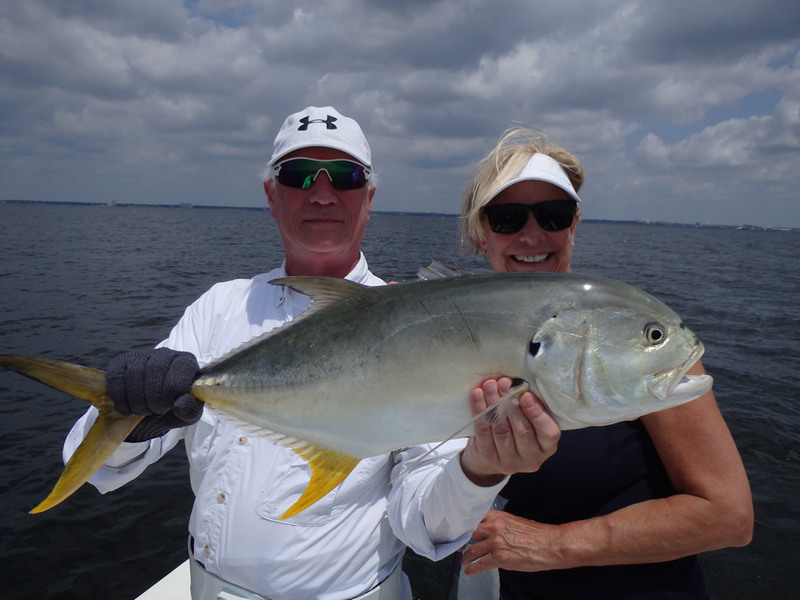 We were skunked two days before and on May 19 anchored on a sandbar in Santa Rosa Sound to have lunch and a school of about 50 jack crevalle swam by the boat heading down the flat. We fired up the motor and ran well down the flat to get ahead of the school, and I got up on the poling platform to get the boat into position. Here they came in typical tight formation, and Johnny dropped the big white popper into the school hooking up immediately. 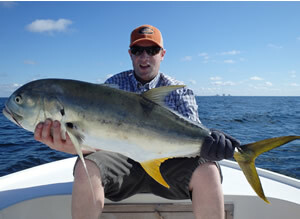 These were reasonable sized fish, and Johnny boated his first jack in about 15 minutes. 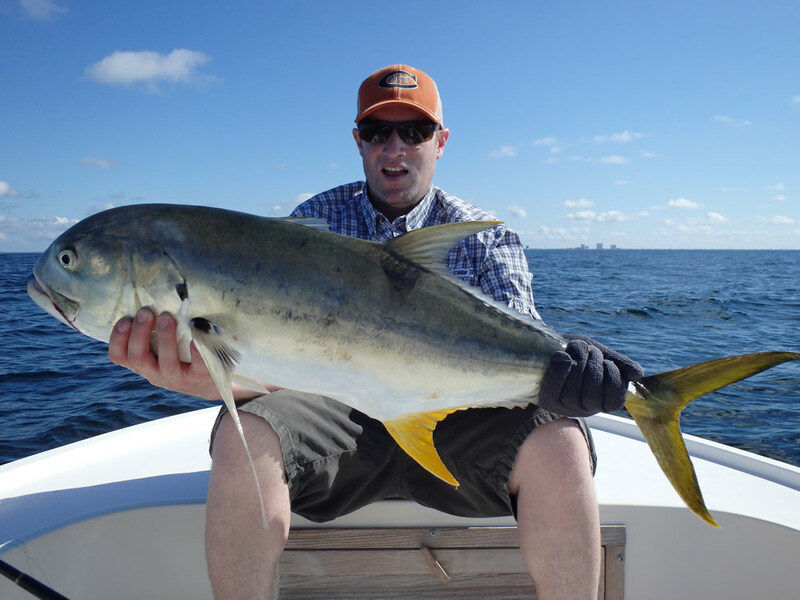 The school of jacks stayed on the flat, and we could see them close to shore in a couple feet of water terrorizing baitfish. 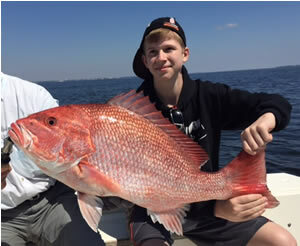 Johnny was game to try for another, and as I poled toward the school the fish all turned and came toward the boat. 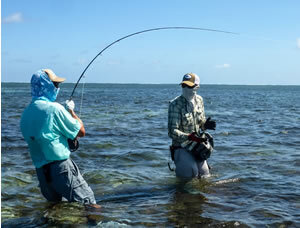 It wasn't long before he was hooked up again putting a powerful bend in the 10wt. 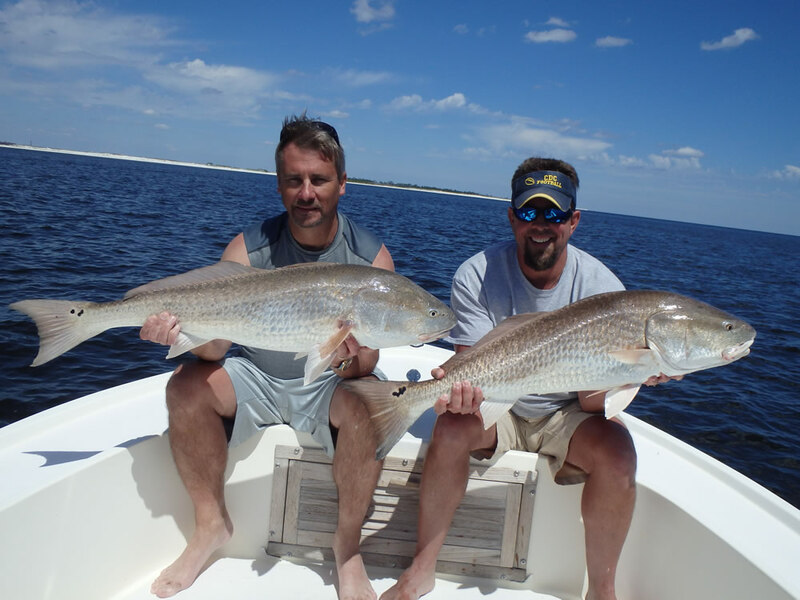 After landing and releasing this fish we decided to spend the rest of our time trying for Johnny's redfish. Double click for a nice side view. 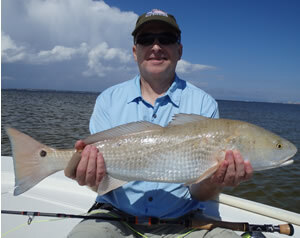 After numerous shots at uncooperative redfish the magic finally happened late in the day. 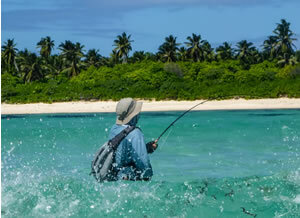 We were poling the shoreline trying to catch up with a couple eastbound trout 5 feet from shore. 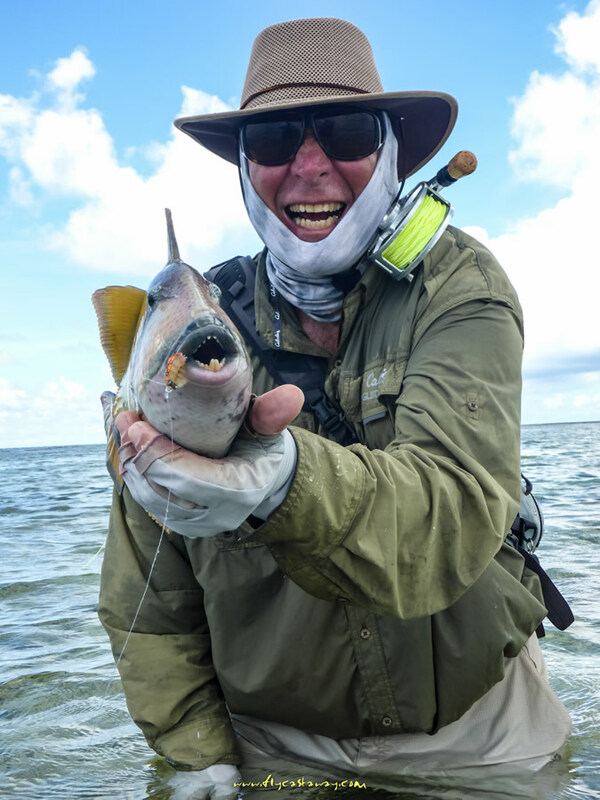 Johnny had gone to one of his own creations... a tan and yellow marabou and rabbit concoction that looked remarkably "shrimpy" in the water. 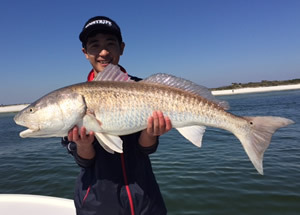 The trout were at 2 o'clock, and Johnny was working out line for a long cast when this 30"+ redfish came into view at 10 o'clock eighty feet from the boat. 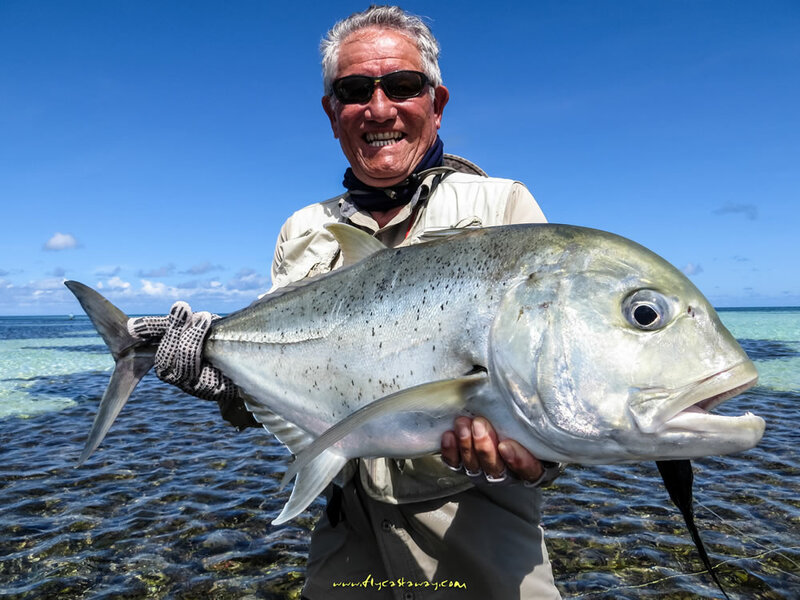 He did a fine job keeping the line in the air while rotating the direction of the cast and dropped the fly ten feet left of the fish. 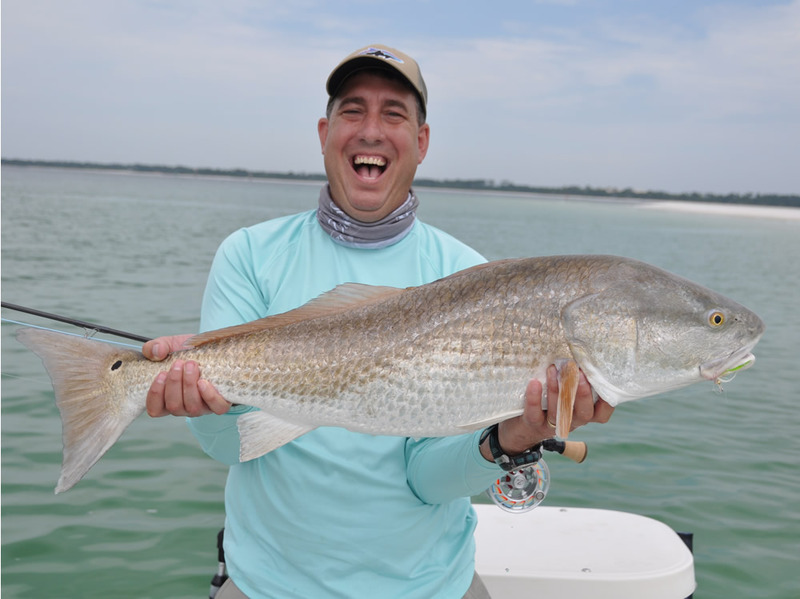 When the redfish saw the "shrimp" diving for the bottom it charged over and nailed it. 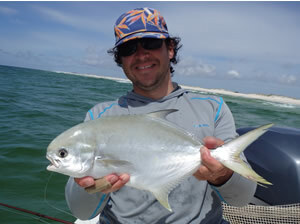 It was a great ending to two days of extremely technical flyfishing for redfish. 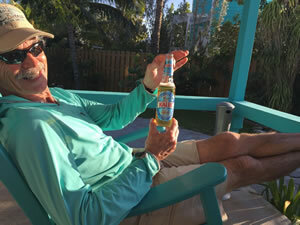 Johnny didn't make another cast. 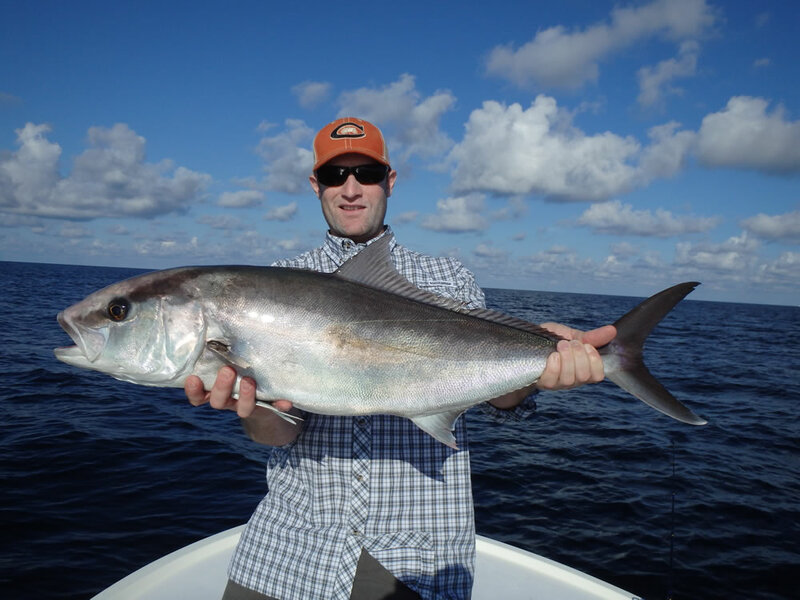 Jake Tessler with the fish of the day on June 1...a 35" amberjack landed on a topwater "chug bait" over structure a few miles out in the Gulf. 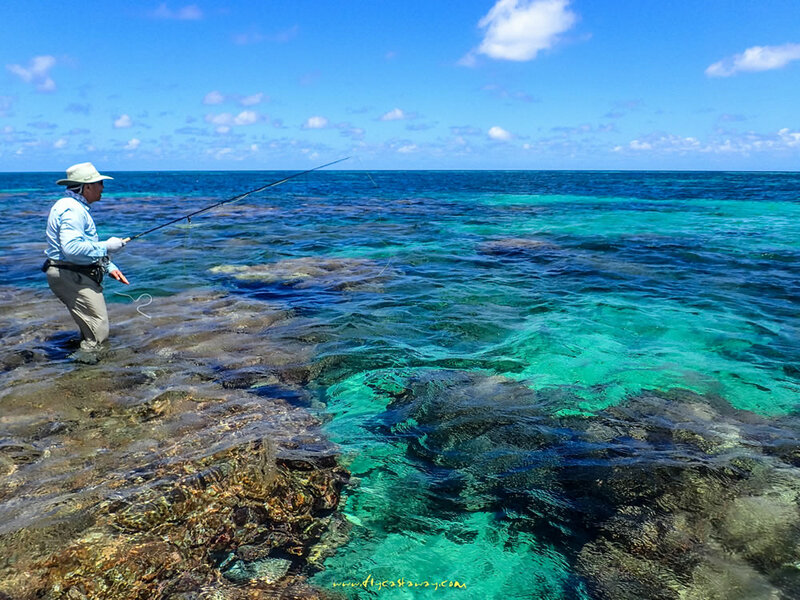 It doesn't get much better on big spinning tackle. 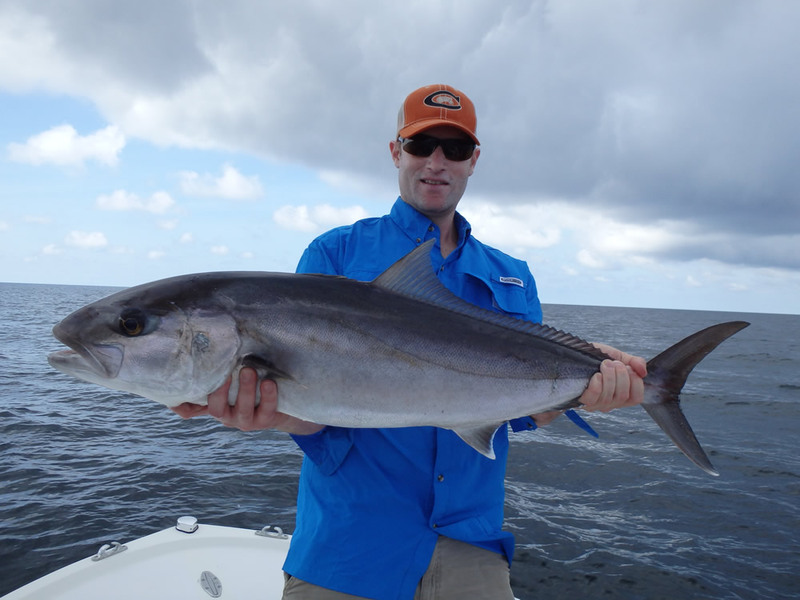 On June 3 Bruce Trumbull and Jake Tessler experienced an amberjack feeding frenzy at the Tex Edwards barge SE of Pensacola Pass. 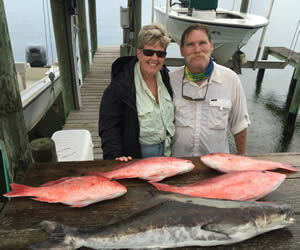 There were AJs exploding all around the boat when a big fish crushed Bruce's popper and headed for the wreck 75' below. 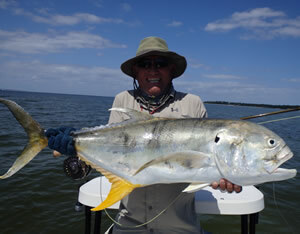 Bruce brings out his "inner-Neanderthal" by fighting big AJs on 10wt tackle and very little drag. 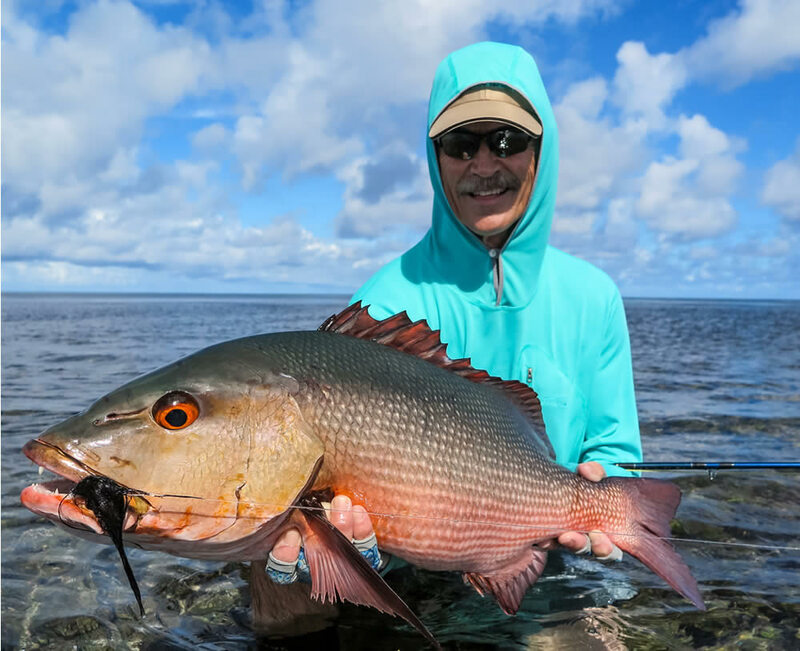 He stops the fish by palming the reel, and by-the-way doesn't wear gloves! When that first fish made it to the wreck cutting him off Bruce turned to me and said "Baz, if I hook another one he ain't making it to the wreck!" And that's exactly what happened. Another big AJ grabbed his popper and bolted for the structure, but this time Bruce got the jump on the fish and stopped it before it reached the wreck. 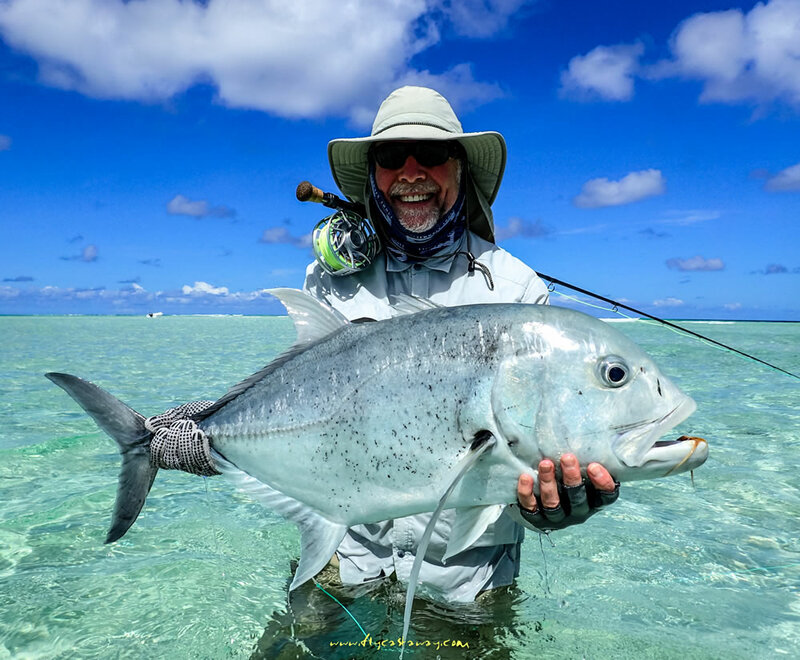 It was an epic tug-of-war with the AJ fighting for its life and Bruce applying all the pressure possible with his twenty year old Sage RPL 2-piece 10wt. 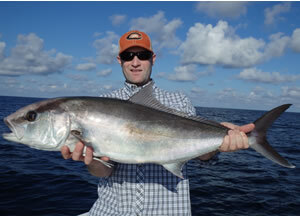 Here's the photo of a bloody-knuckled Bruce with the new boat record amberjack which measured 33" to the fork. We released the fish unharmed. 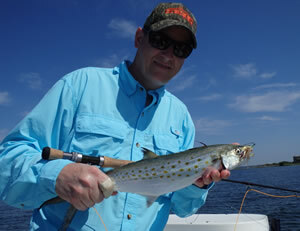 A nice shot of Bruce's "tube" popper from Chris Windram at www.saltwaterflies.com. 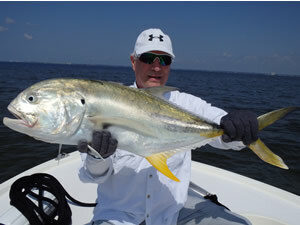 We snell a 3/0 "live bait" hook to 8' of 60# fluoro, and the popper body slides free on the leader. 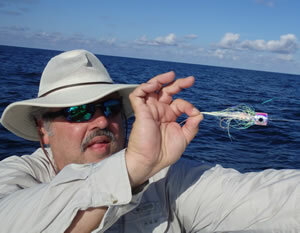 When Bruce's first fish cut him off the popper floated to the surface. 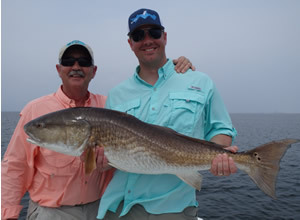 We tied on another hook, slid the popper on the leader, and Bruce was back in business. 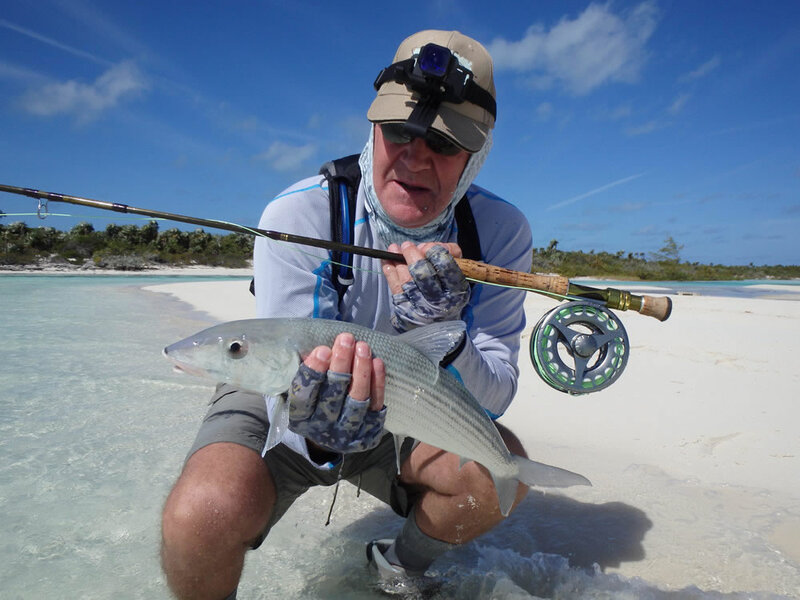 It's a very slick way to fly-fish over structure. Thanks for the poppers, Chris! 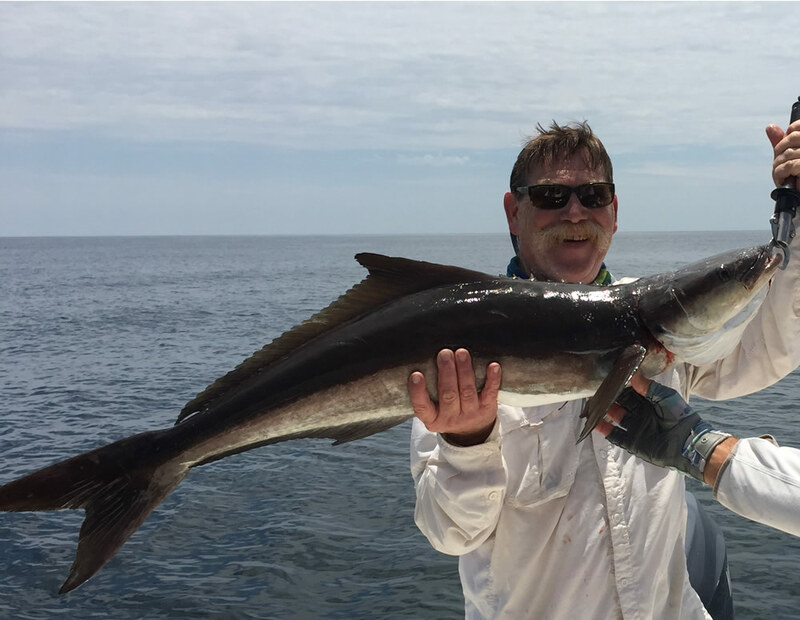 Jake had a blast landing and releasing AJs of this quality on spinning tackle and even brought a 40# cobia to the boat which we lost at the net after electing to not gaff the fish. 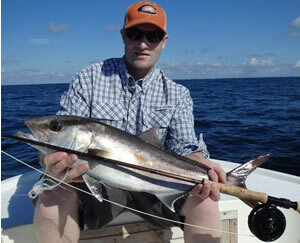 Not to be outdone by Bruce, Jake borrowed the 10wt and landed his first amberjack on fly. 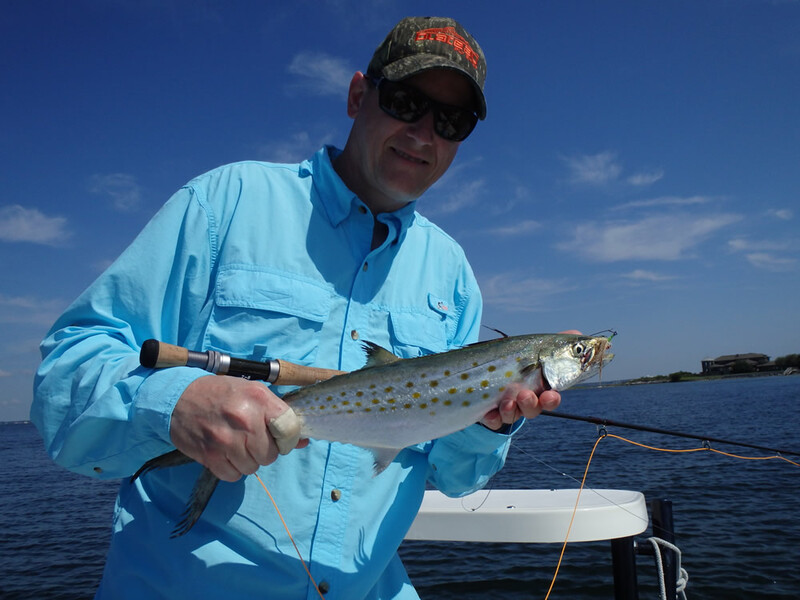 Kudos to Jeff Harper on June 7 with his first saltwater fish on fly...Spanish mackerel. 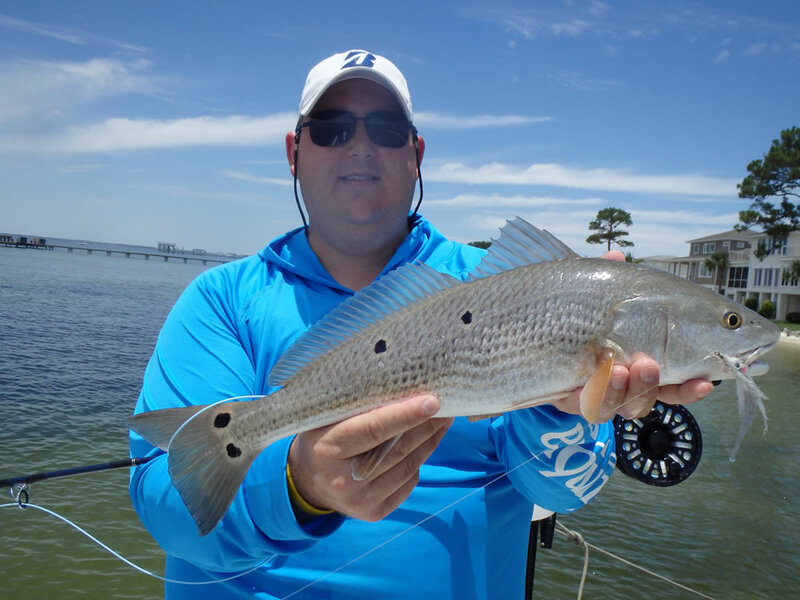 "Technical" was again the word for the redfish on June 8, but Patrick Pedano persevered and landed this redfish...his first on fly...on an EP baitfish. The smile says it all! 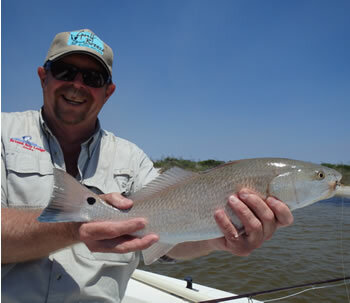 Ted Calcaterra, St Louis, on June 13 with a trophy redfish. 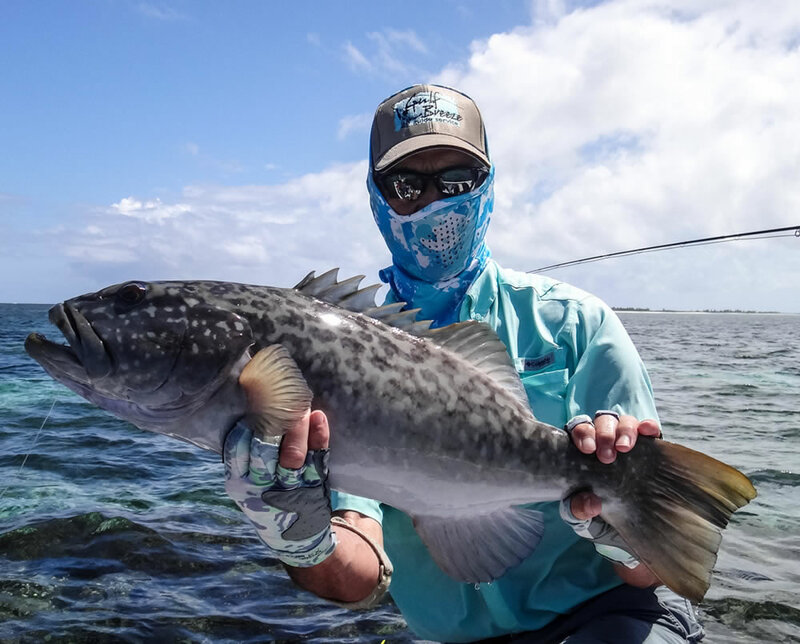 There was a very spooky school of big fish living along the beach in the Gulf, and we decided to sneak up on them and try a secret "worm" pattern. 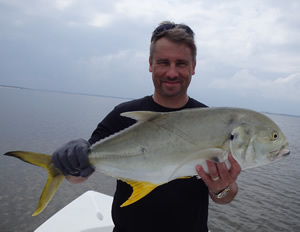 We were in 2-3' of water when this fish cut out of the school and attacked Ted's fly. It was a beautiful thing to watch...his all-time biggest redfish on fly. 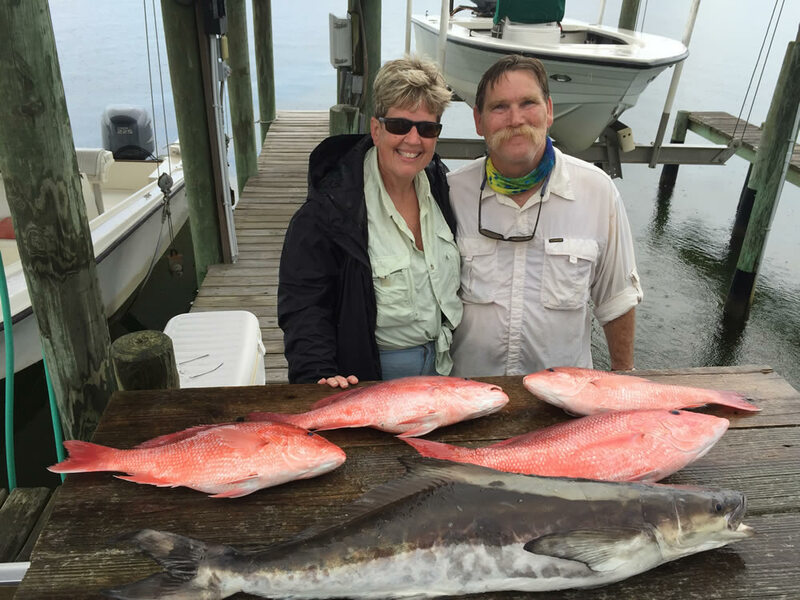 On June 13 Steve and Patti Heacock were in town from Baltimore for their annual red snapper trip. 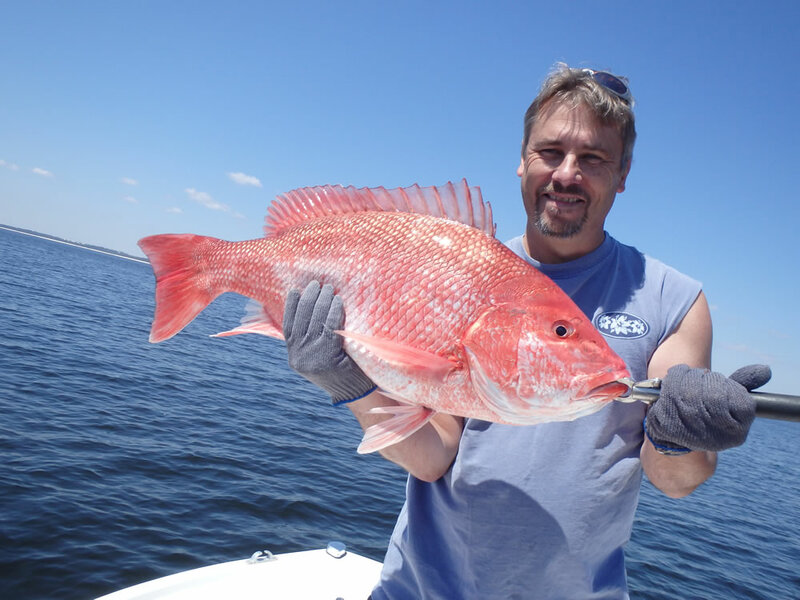 We limited out on Pensacola Bay red snappers in the first 30 minutes and then ran out into the Gulf for some "fun" fishing. 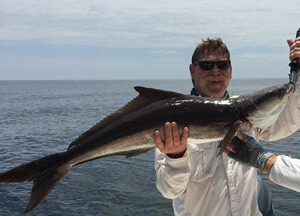 Steve was preparing to "freeline" a live cigar minnow for amberjacks when this cobia swam up behind the boat. 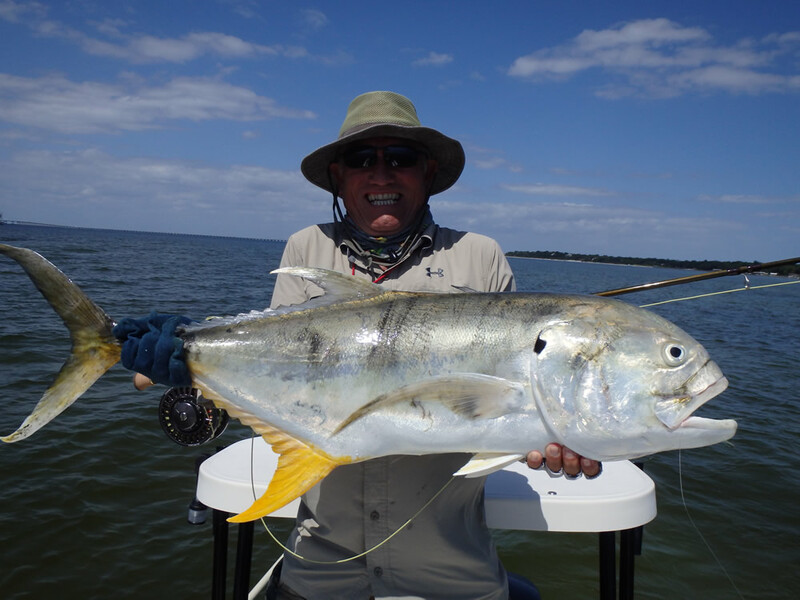 London's Mike Youkee was in town for a week of tarpon fishing but had to settle for this beast of a jack crevalle on June 20.